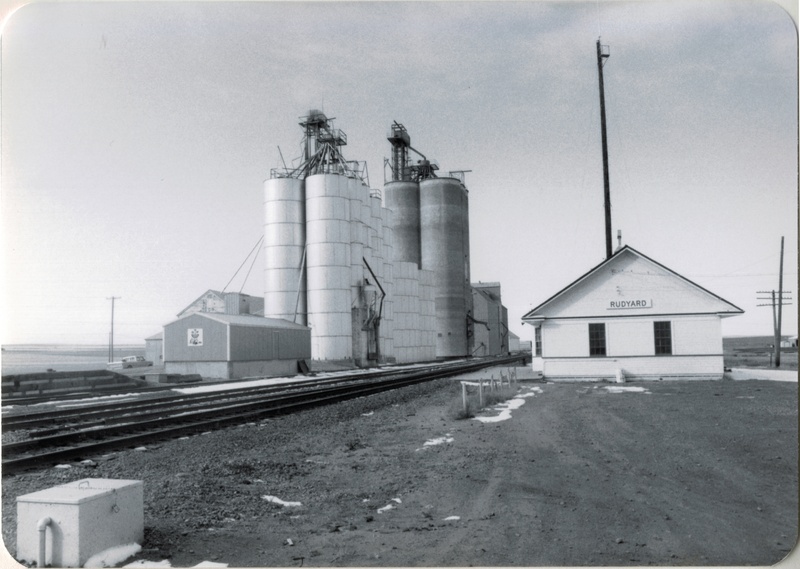 In my 1984 fieldwork, Havre was a base for quite a bit of travel along the Hi-Line. 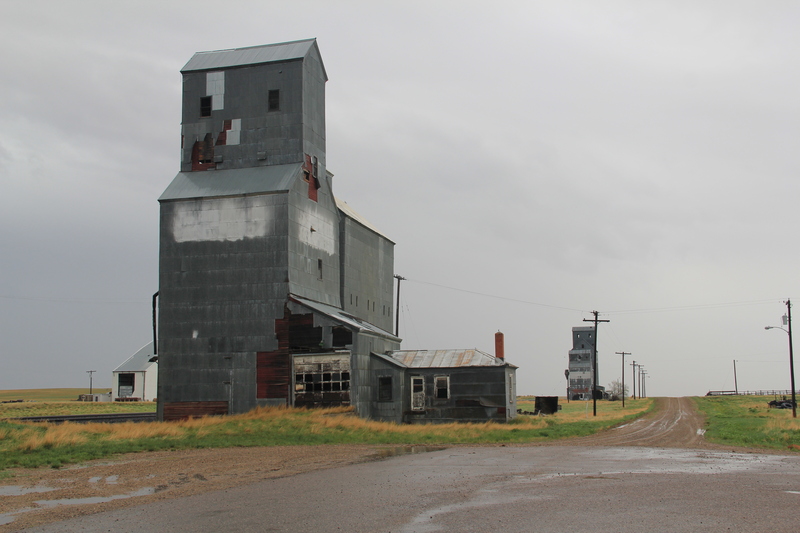 One of the most compelling landscapes, and among my favorites for the state, were the little towns, regularly spaced about every eight miles, west of Havre. 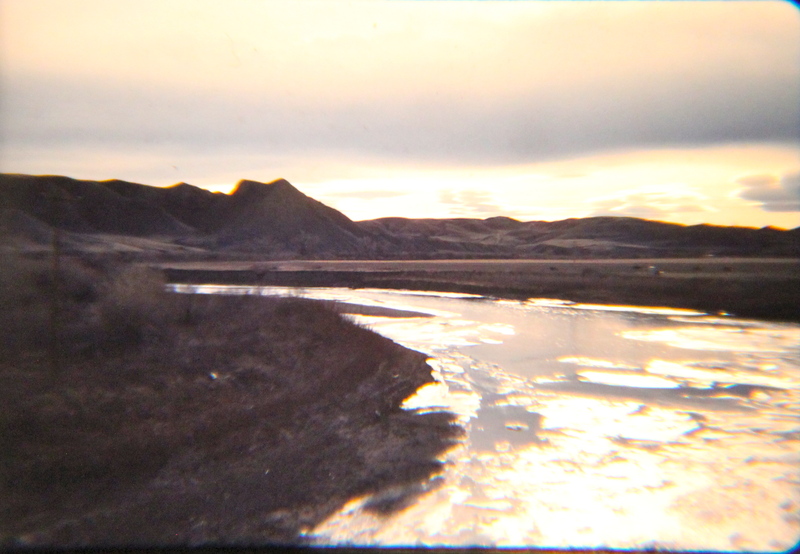 At the time, my understanding of this landscape was heavily influenced by recent works by the American Studies scholar John Stilgoe (Metropolitan Corridor: Railroads and the American Scene) and the historical geographer John Hudson (a series of articles that culminated in the book Plains Country Towns.) Stilgoe reminded me that railroads in the late 19th century not only defined towns and urban design but impacted American culture in how small, tiny spaces became part of urban, metropolitan life through the steel tracks. 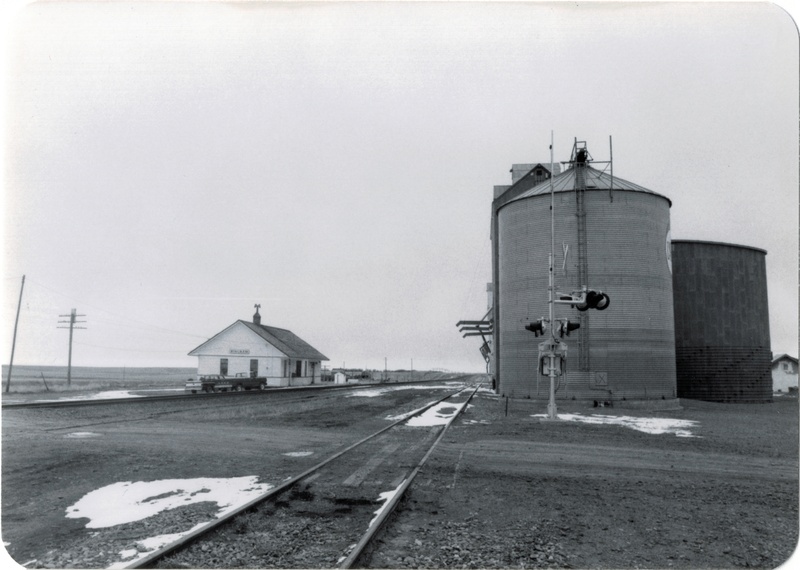 Hudson explain why towns existed every six to seven miles or so throughout the plains (these were often single track lines so trains needed places to pull over for passing, and places where water and fuel could be acquired as necessary). 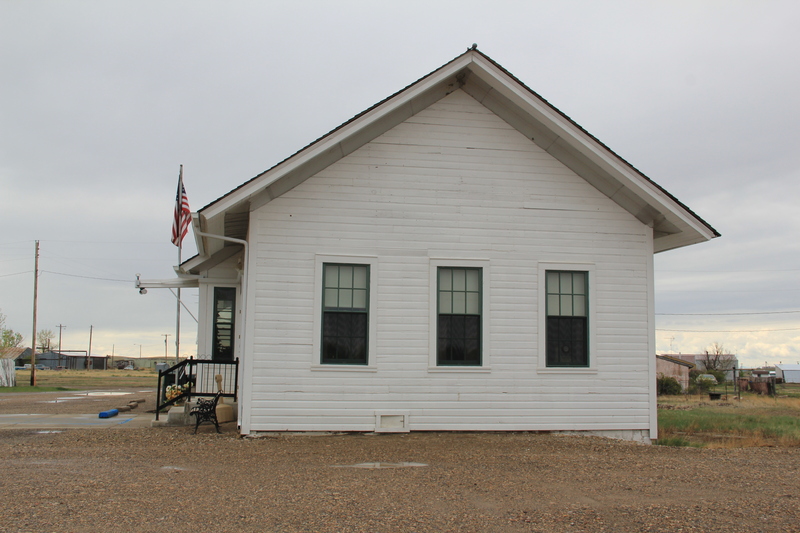 Hudson explained differences between railroad division points, where shops and offices would be located, and “country towns,” where typically a combination depot carried out all of the railroad’s corporate functions. 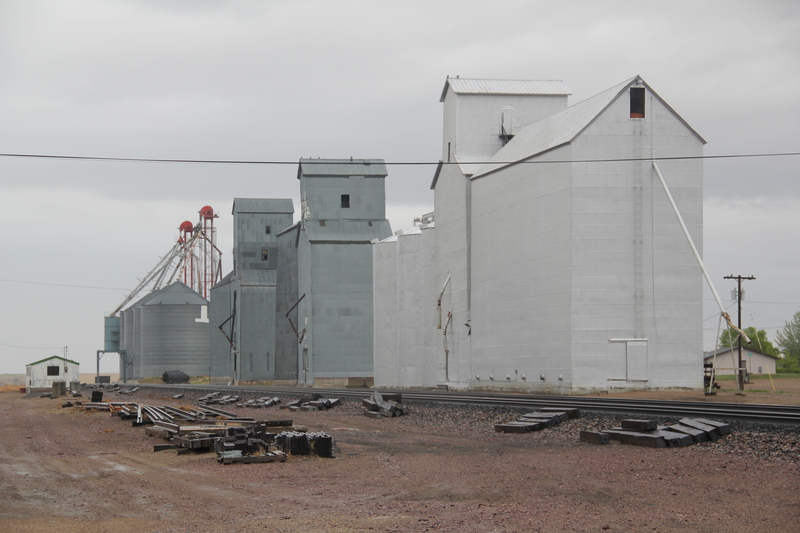 This arrangement of space, and the ennobling of railroad culture in larger towns, was exactly what I saw in Havre and Hill County. 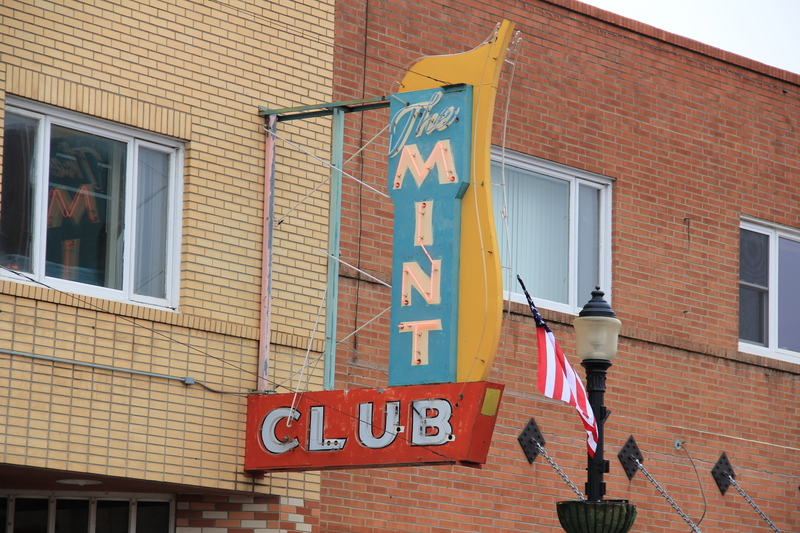 Ever since 1984, this has been among my favorite places in Montana. 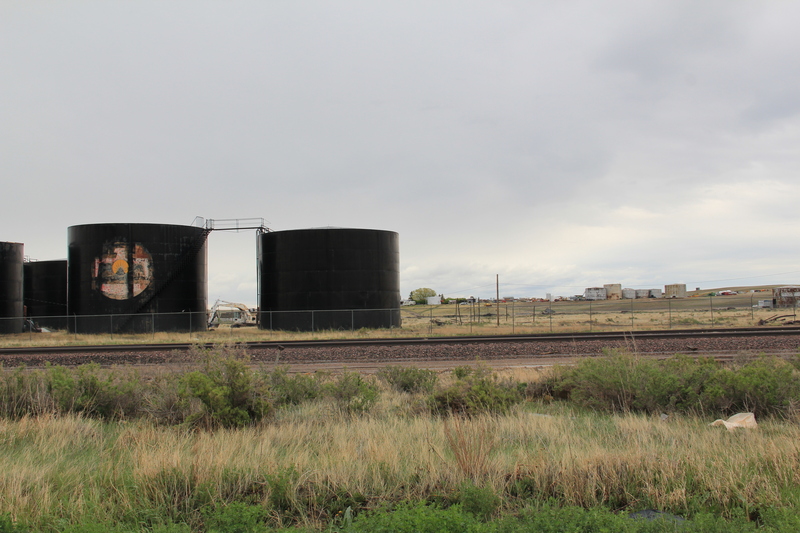 In a posting last year I discussed the “disappearing depots” along the Hi-Line, focusing on west Hill County. I want to revisit those same places today, with a deeper view on what was there in 1984 and what you find today. Inverness, established c. 1909, was the first place I stopped but spent little time there because already in 1984 its Great Northern depot was gone. But in 2013, I was looking for beyond the Stilgoe-Hudson way of understanding plains country towns. 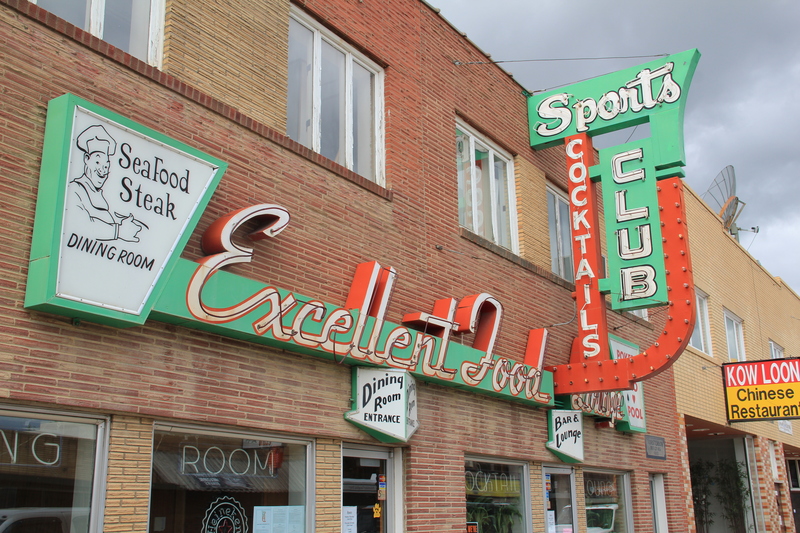 Inverness in 2010 had 55 residents, but still held several early settlement landmarks, such as its early 20th century elevators along the railroad, a National Register-quality c. 1920 store/gas station, and two large two-story frame blocks–the historic Inverness Hotel (most recently Inverness Supper Club) dates to the second decade of the 20th century. 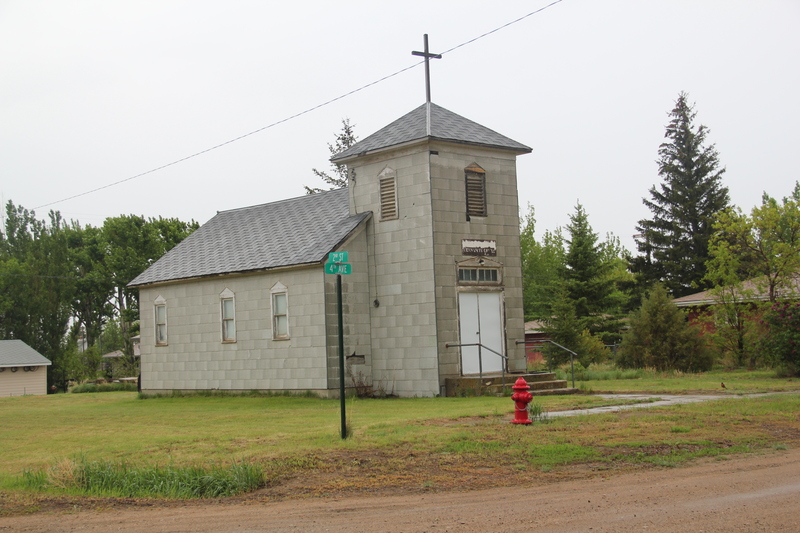 The Sacred Heart Catholic Church dates to the town’s beginnings, but a brick school from 1931 with 1952 additions closed in the early 21st century. 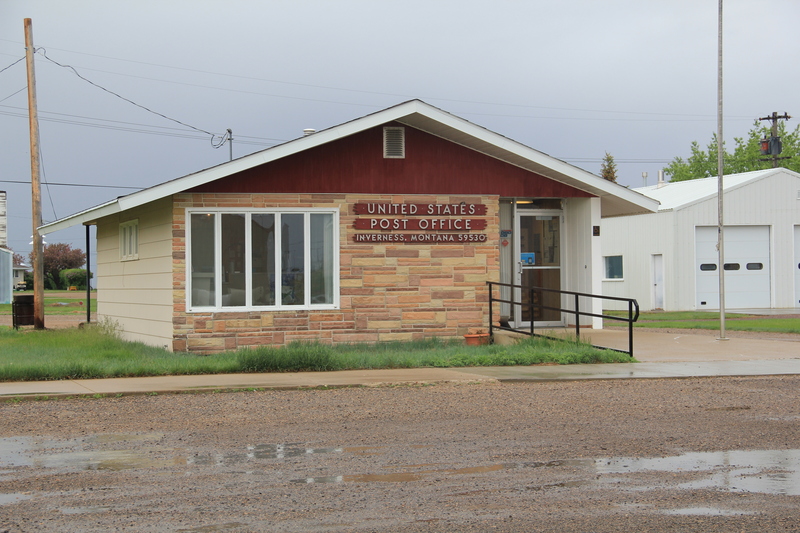 Inverness’s c. 1960 post office is a great example of stone-faced standardized design that the postal service used in small towns across the nation in that decade. 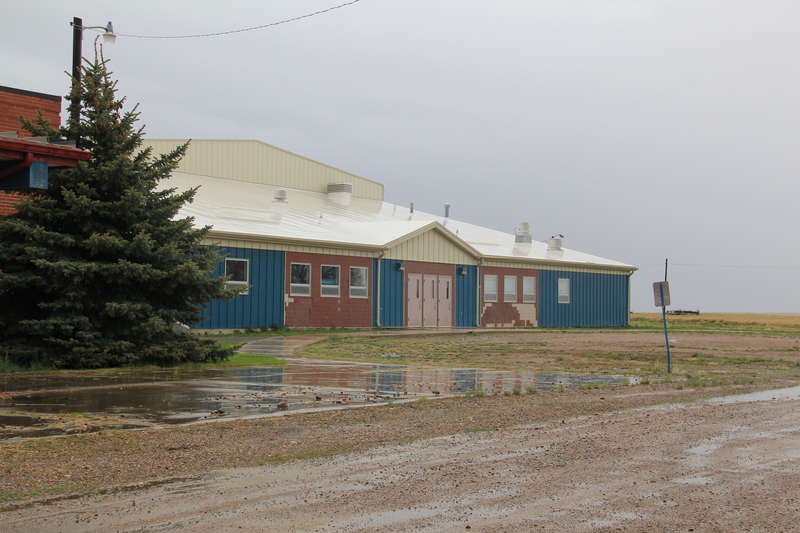 It was one of the offices threatened with closure in 2011. 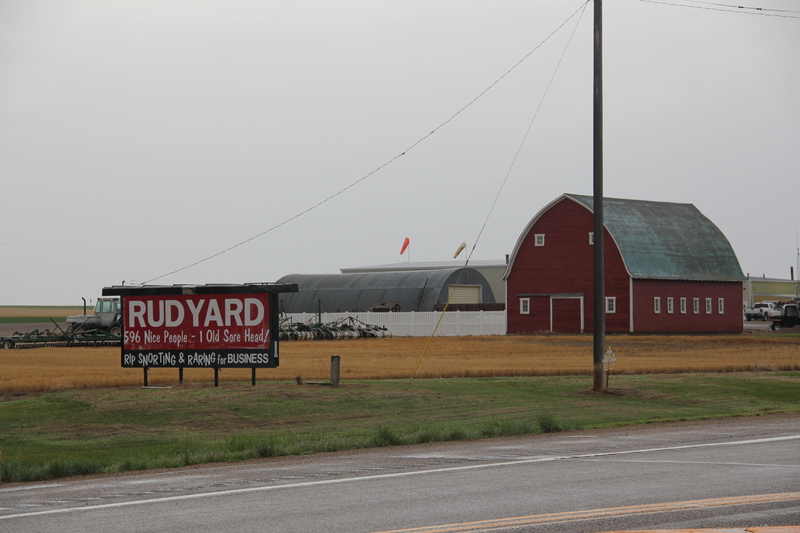 Rudyard, established 1909, was the largest of the west Hill County towns, about 500 people in 1980 but now with only 258 residents according to the 2010 census. 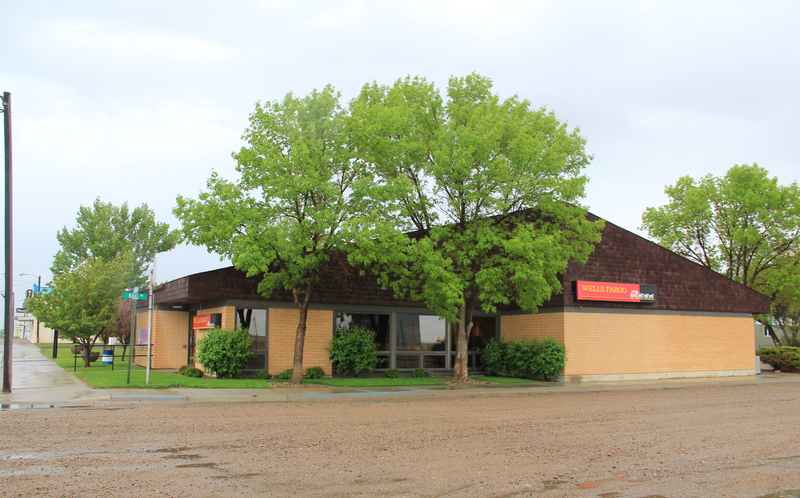 Its prominence in the second half of the 20th century is reflected in two buildings: the tall concrete grain elevators along the railroad and the contemporary-styled Wells Fargo bank building on the prominent town corner facing the tracks and Reed Street. 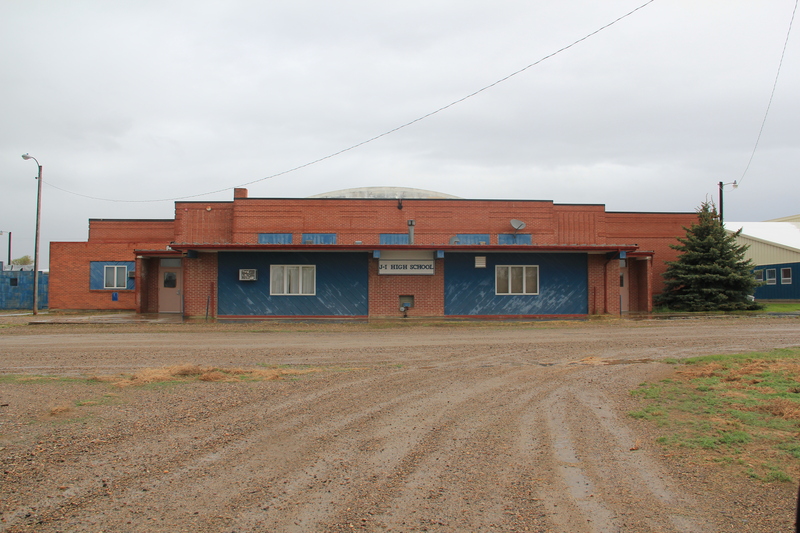 Thirty years ago, as the construction of a modern bank building attests, several stores and the Hi-Line Theater were hubs of activity; today most businesses are closed. Museums now abound–with the moved depot forming a small building zoo while an early 20th century stone building has become an auto museum. Rudyard also has one of the highway’s most famous town signs–boasting of a population now greatly diminished but the old sorehead remains–at the Sorehead Cafe in the heart of the four block long commercial district. One hundred years ago, Hingham (1910) seemed to be the town that would make it. 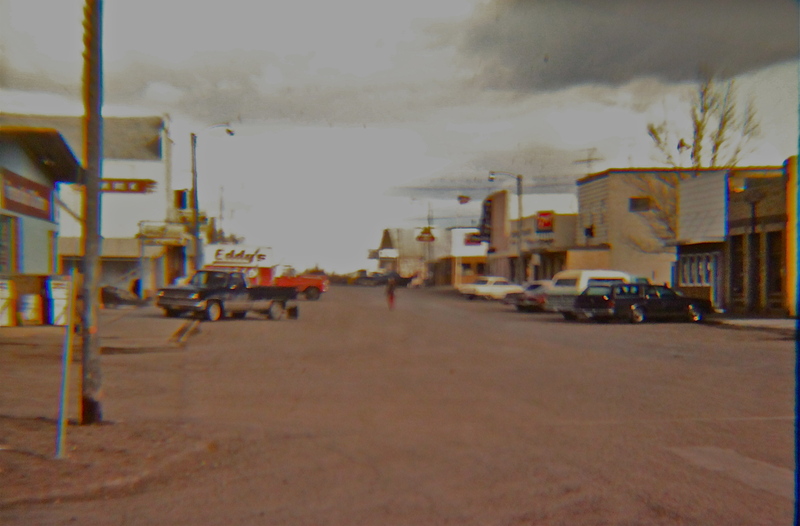 From the railroad corridor several blocks of commercial businesses were filled in the next decade. 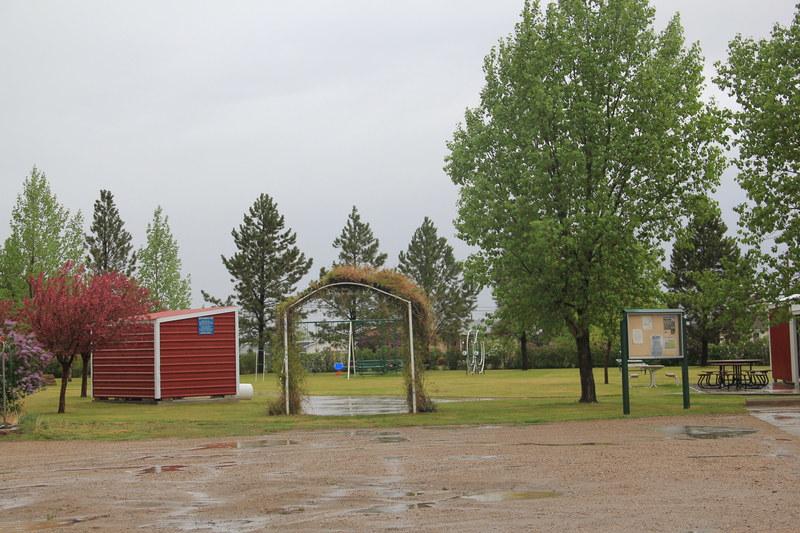 There was a town square featuring a city park in the midst of it all. 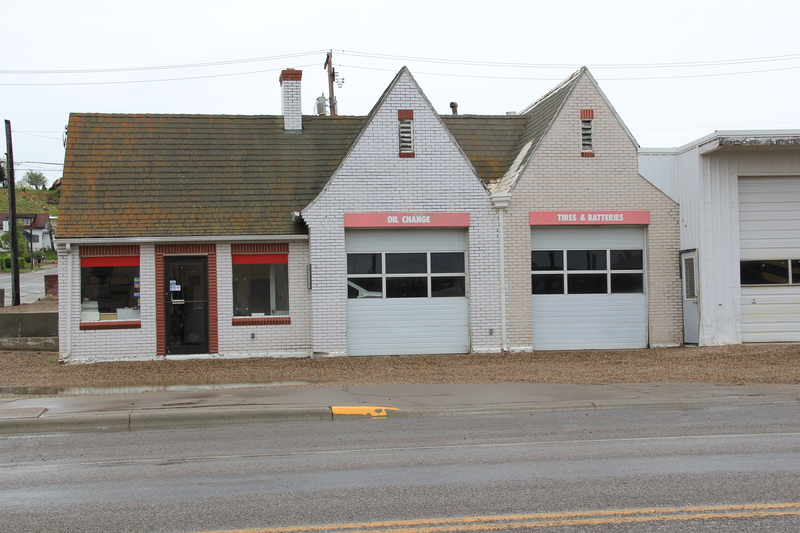 While the buildings, outside of the brick neo-classical brick bank (1913-14), were frame, town boosters were confident these were only the initial businesses. 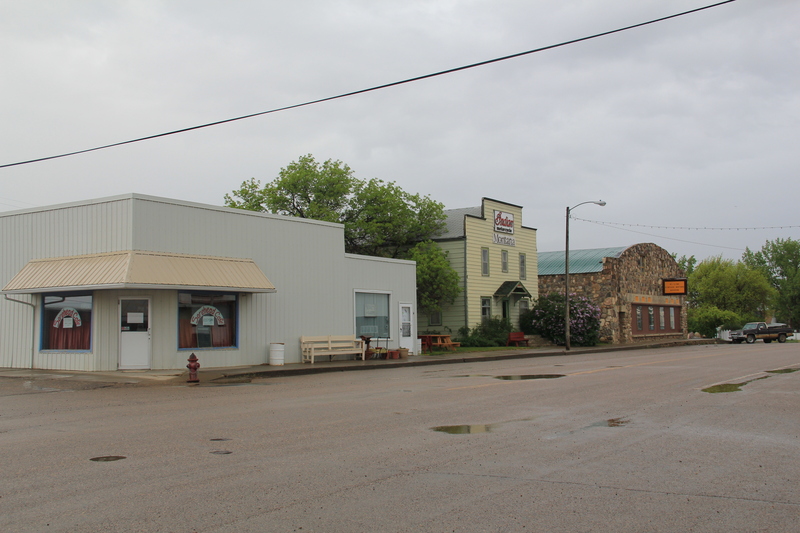 But the second decade of the 20th century proved to be the town’s high point, and frame buildings still define local businesses. In 1930 they defined the town with a large, handsome two-story brick school at its south end (near U.S. 2, a recognition of the highway’s importance in getting students to and from Hingham). 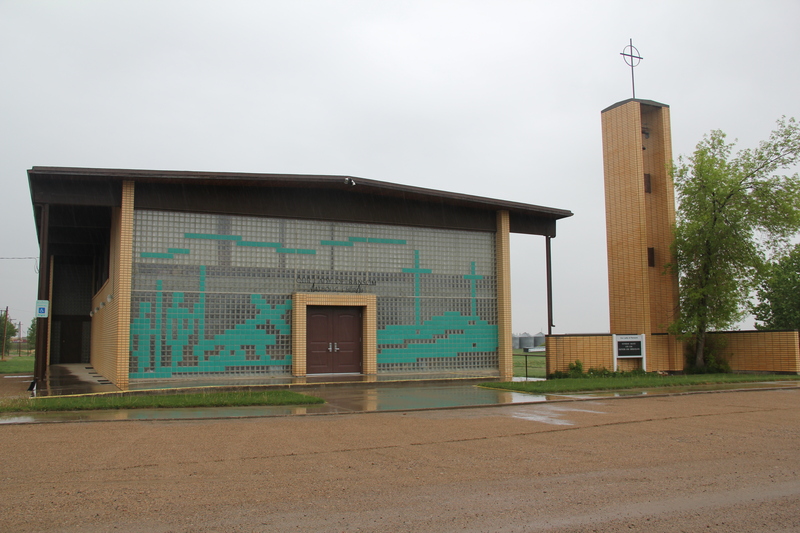 The Our Lady of Ransom Catholic Church is a modernist landmark, and one of the most architecturally important buildings of the Hi-Line, part of the Great Falls diocese effort to improve and modernize its churches in the mid-20th century. 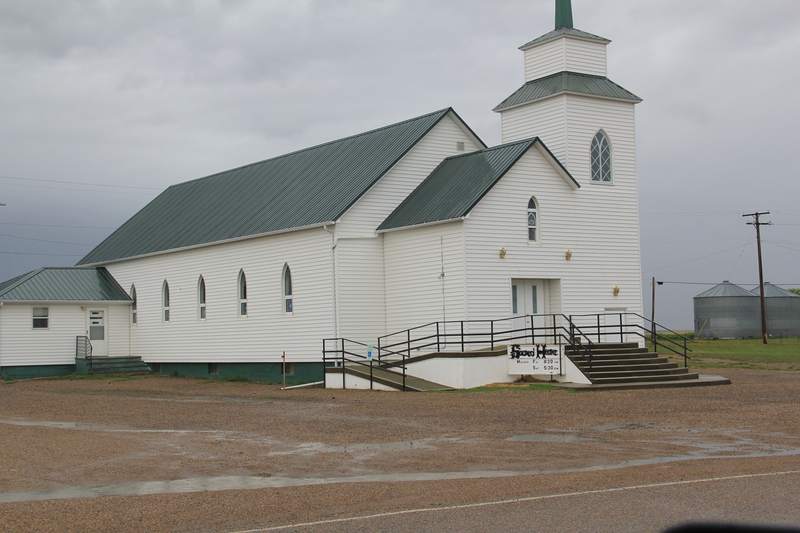 A much earlier frame Methodist Church remains, and has most recently served as a community chapel. 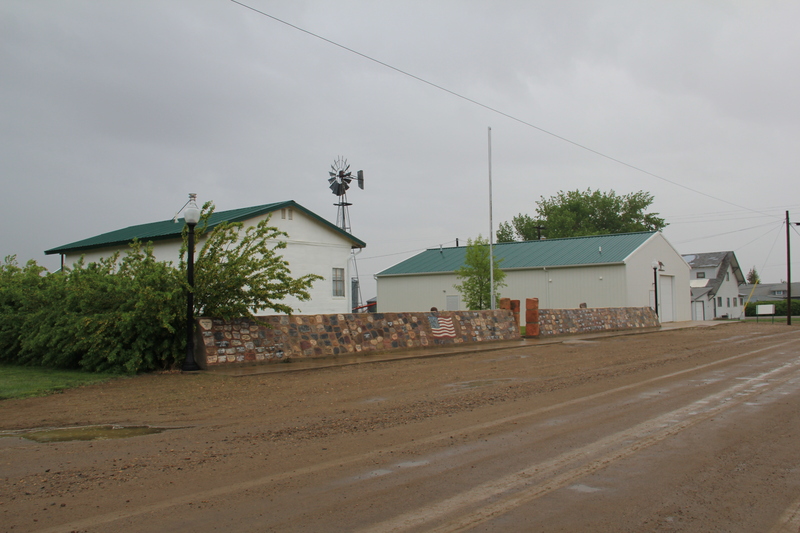 The boosters of Gildford also had high hopes in 1910 and the homesteading boom brought a full fledged town into existence by 1915-16. 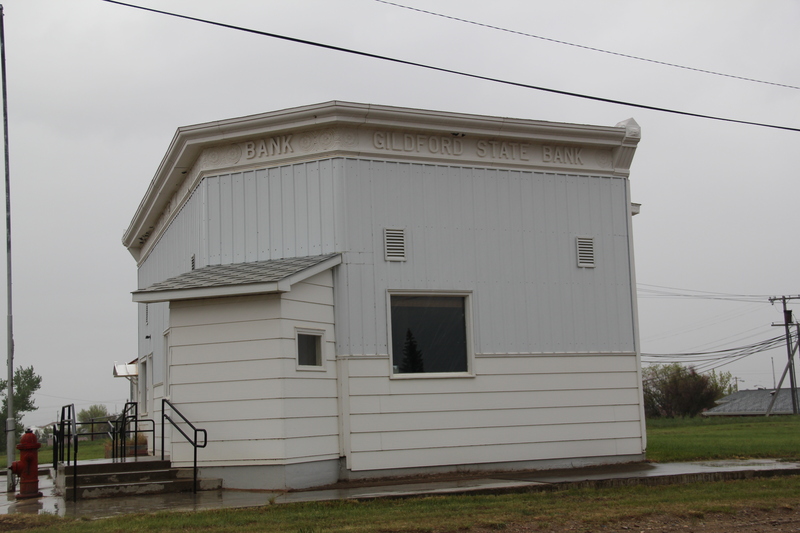 The boom decade is marked by the extant Gildford State Bank (1914), which also served as the town’s post office when I first visited in 1984. 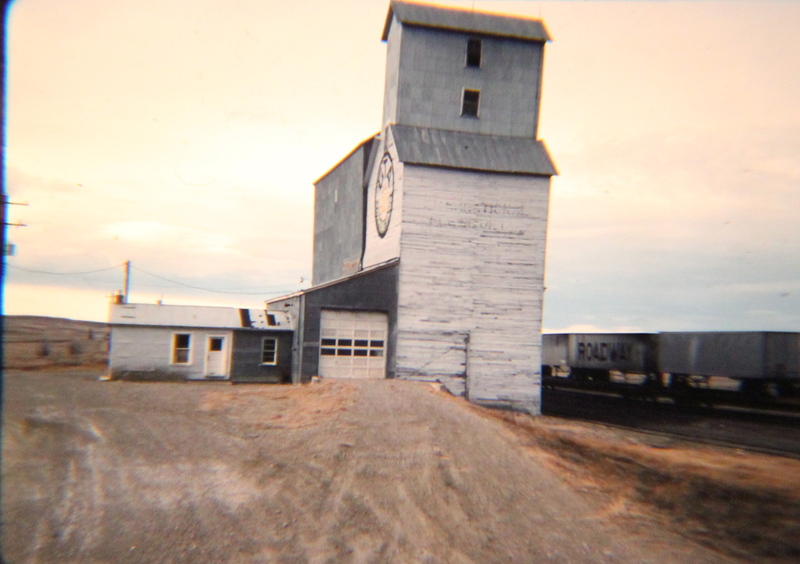 The town also had an early industry, the Mundy Flour Mill. 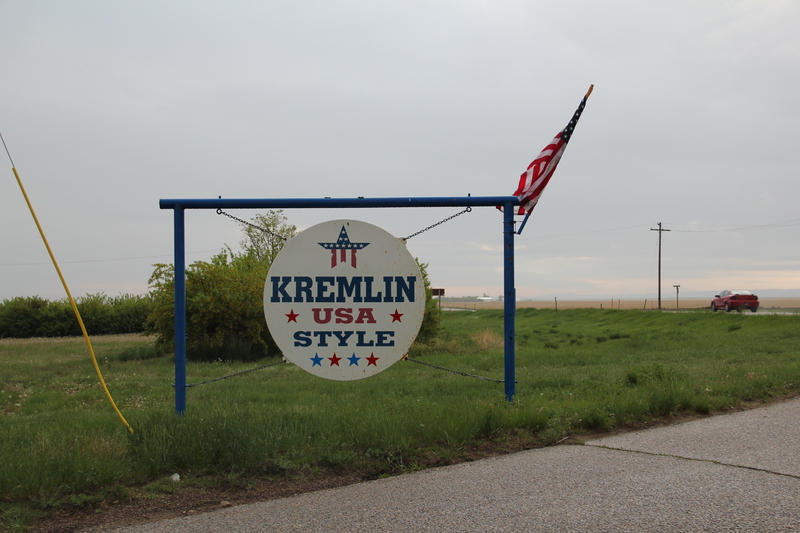 Kremlin acknowledges its distinct name with its highway town sign. 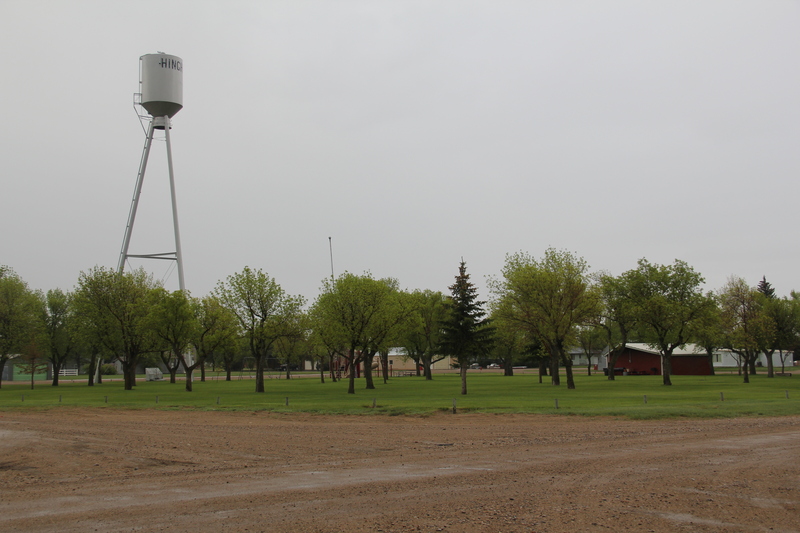 Settlement began in 1909, with a plat from land agent K.C. 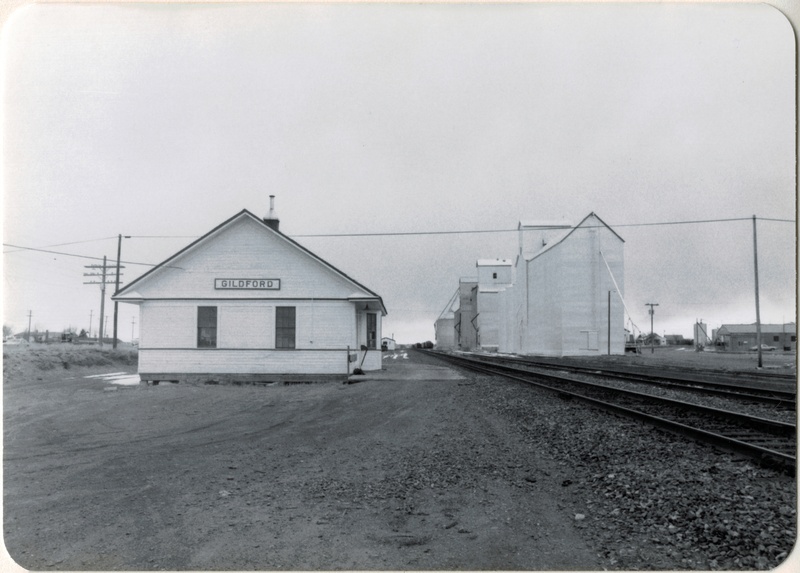 Farley, focused on the Great Northern section house, later replaced by a standardized depot, all of which is gone from the railroad corridor today. 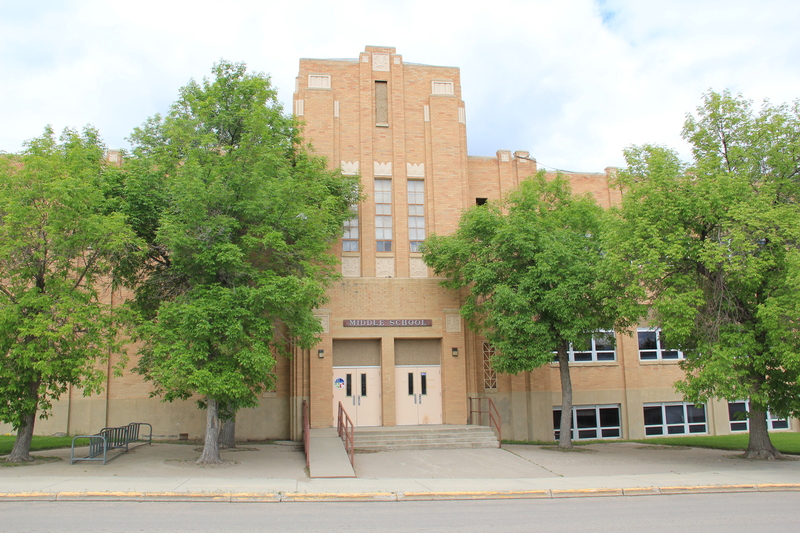 The WPA built a new high school in 1938, which remains a central landmark for the community, a symbol of the future, and a good way to end this posting. Another contribution of the Commercial Club was the creation of a town square park, complete with bandstand: the Joplin Community Band was popular throughout the region, until it disbanded in 1937. Two years later in 1939, famous be-bop jazz artist, saxophonist Charles McPherson was born in Joplin. 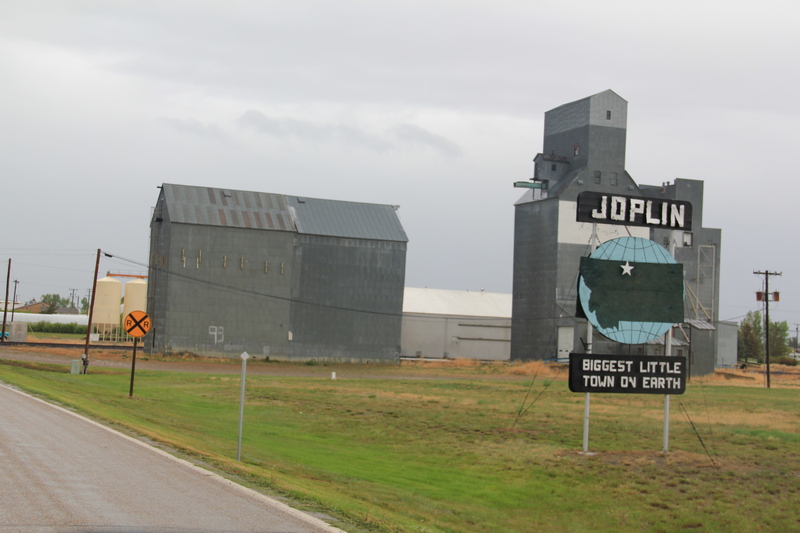 Like most of the Great Northern towns of the decade, Joplin began well as homesteaders came quickly. By 1913, O.C. Boggs of Joplin wrote a testimonial for his huge Nicholas-Shepard Oil-Gas Tractor: “we are pulling six 14-inch Oliver Engine Gang Plows in sod. 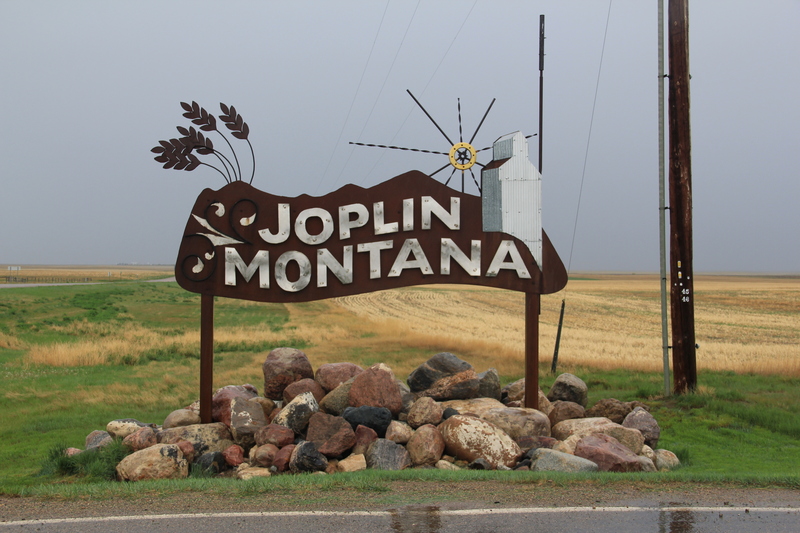 Our average work is 15 acres per day of ten hours” The First State Bank of Joplin opened its doors,along with many other mercantile and professional offices. 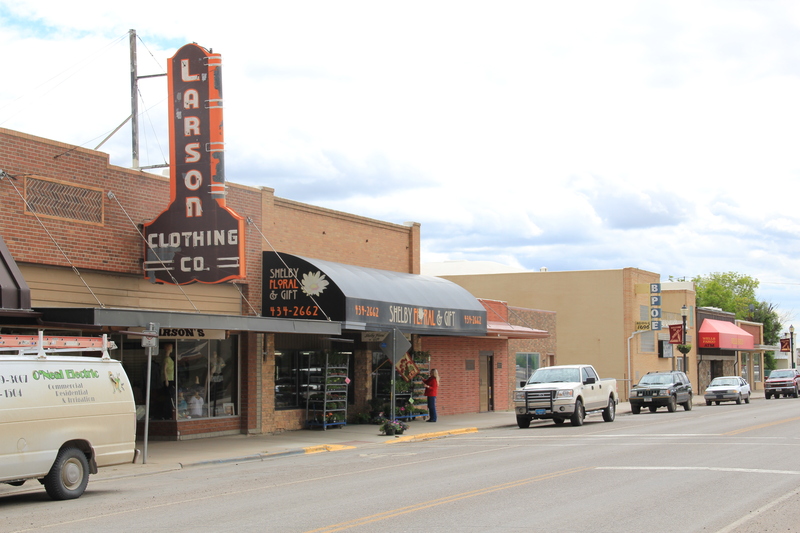 In 1916 Jensen Brothers and Layton hardware stores went into partnership to take advantage of the agricultural boom. The drug company came in 1917. 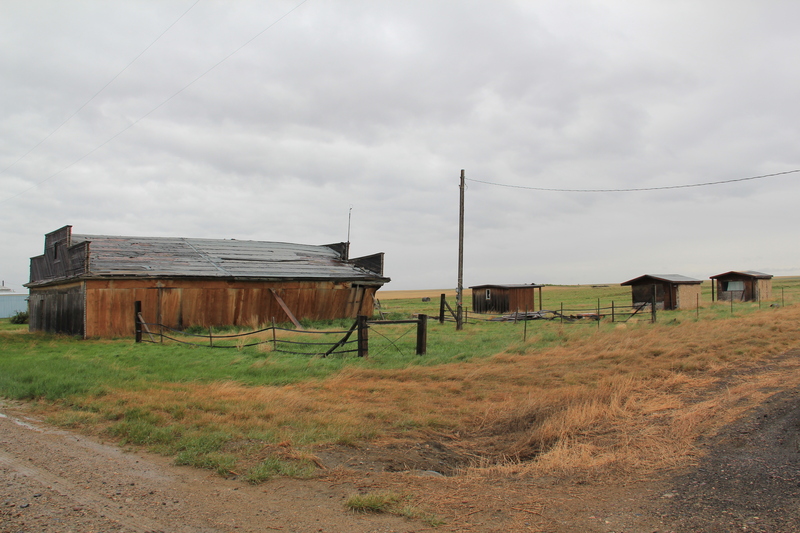 But drought hit this area hard in the late 1910s. In the 1920s the boom had busted, not just because of the agricultural crash. There was the matter of the Dempsey heavyweight fight in Shelby in 1923. 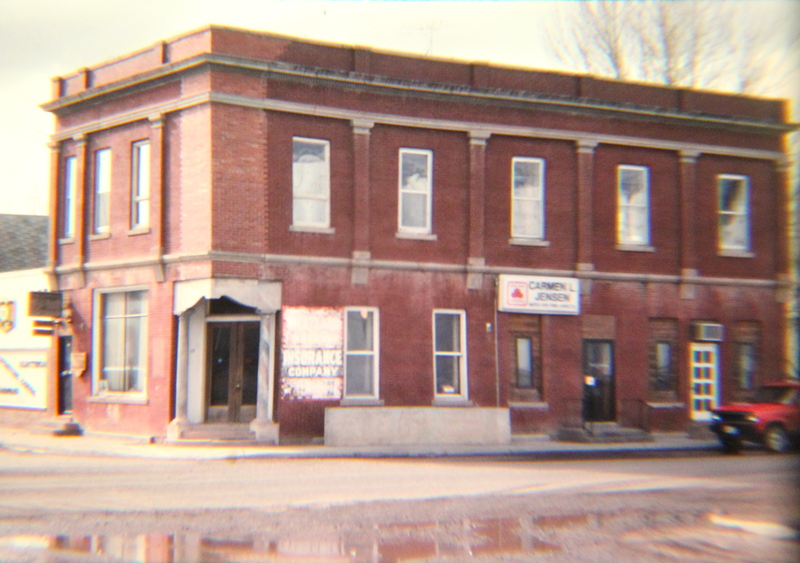 Losses there impacted the local bank, which closed in 1923 just days after the fight. 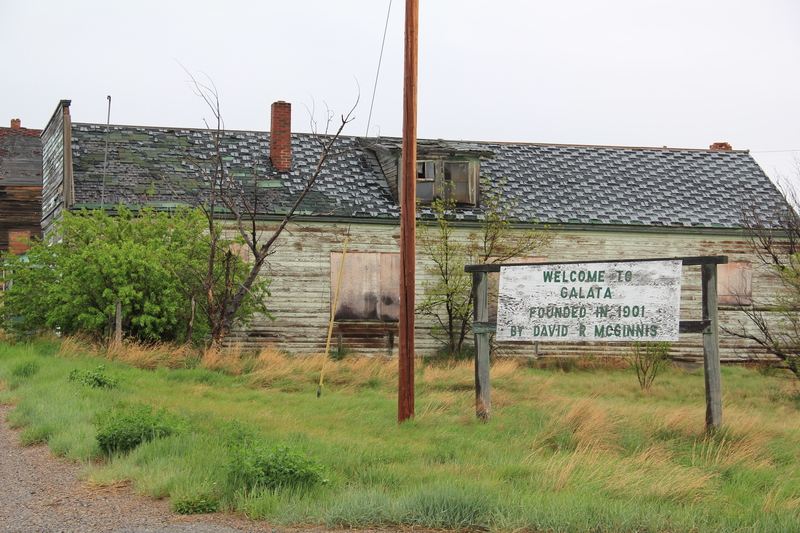 The New Deal brought new hope in the mid-1930s when the PWA helped to fund a new brick school and the WPA funded sidewalks. to remind one of the town’s lifeblood. 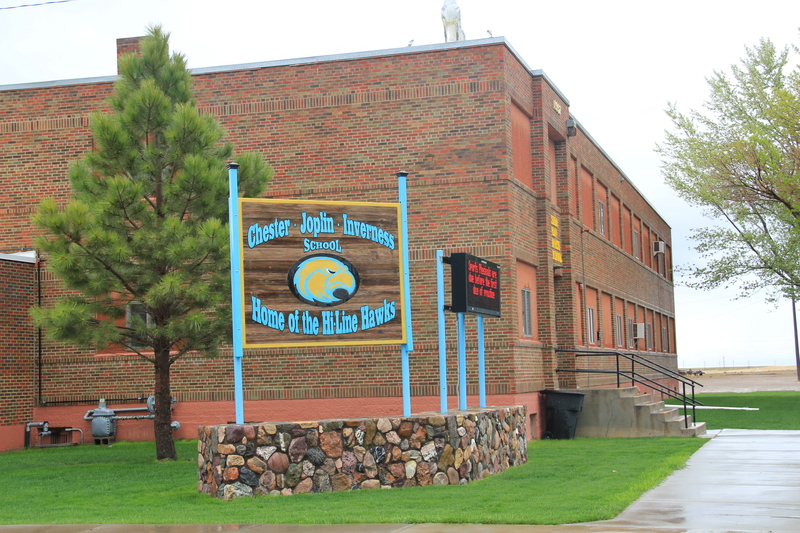 Then the school closed in 2005 and Joplin joined the consolidated school system in Chester. 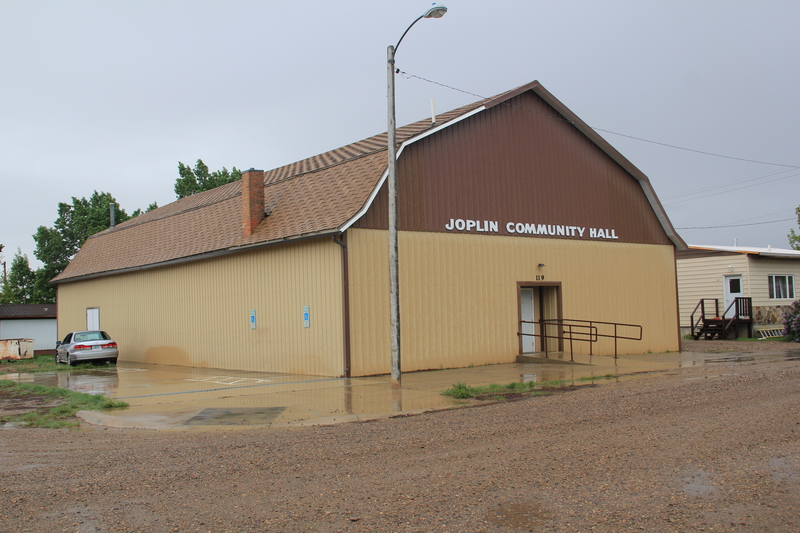 One key institution from the homesteading era still shapes community life: the Joplin Community Hall, where everything takes place: voting, reunions, funerals, parties, concerts, celebrations, especially in mid-June when the town still hosts an antique car show at the town park. 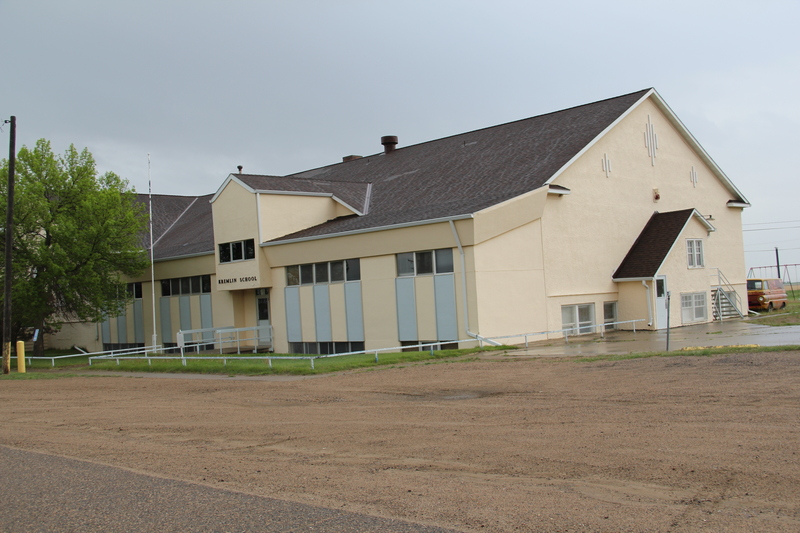 Both the hall and town park were developed by Joolin’s Commercial Club–a forerunner to a Chamber of Commerce–in the first decade of settlement. 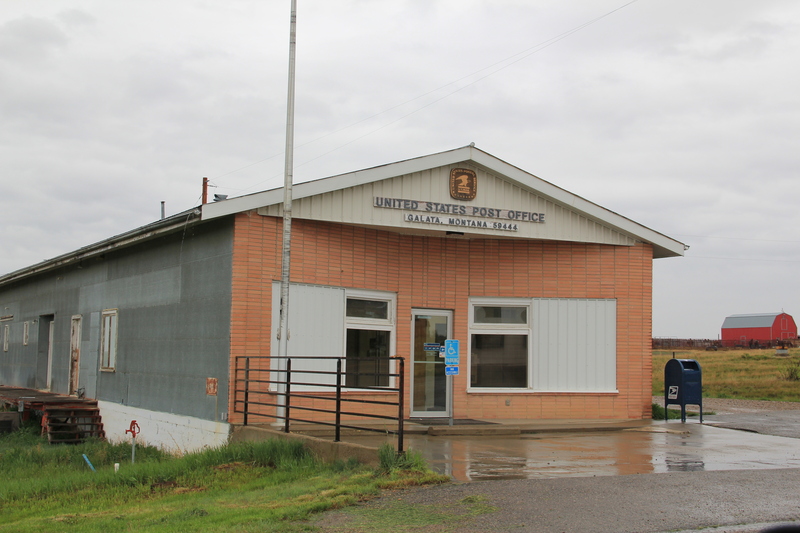 It was at the community hall in 2011, that a large crowd gathered to convince federal officials to let them keep another community institutions: the Joplin post office. 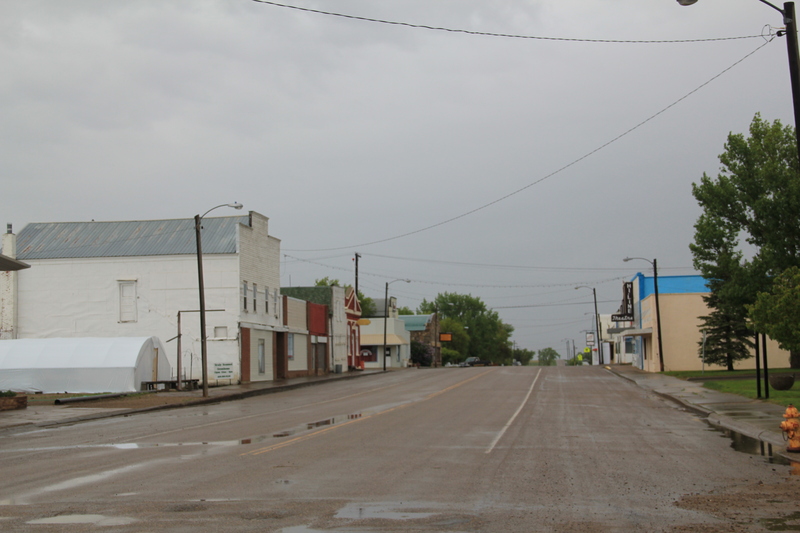 Today along U.S. Highway 2, a bright, shining streamlined moderne town sign has replaced the earlier littlest big town in the world–which remains in the town center, away from the highway as if residents keep the motto to heart but no longer share it with every traveler on the road. 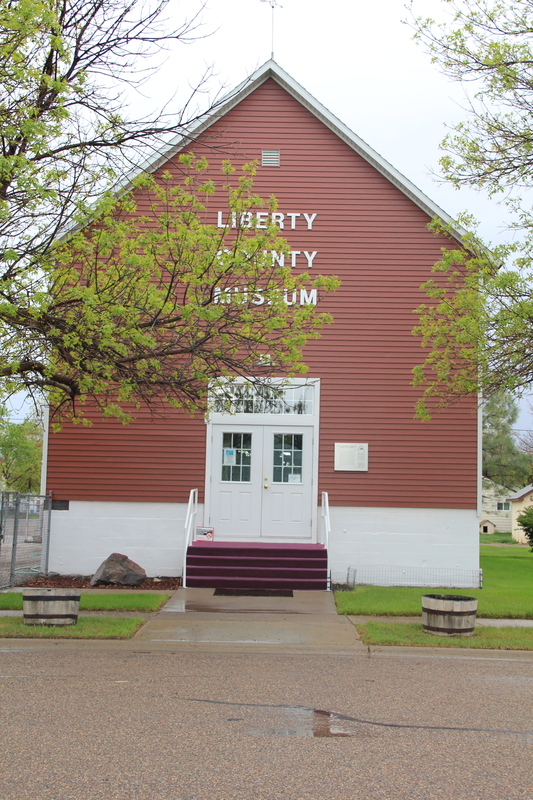 Liberty County, created in 1919 with Chester as county seat, was the next place I visited, and it proved to be one of my favorites along the Hi-Line. 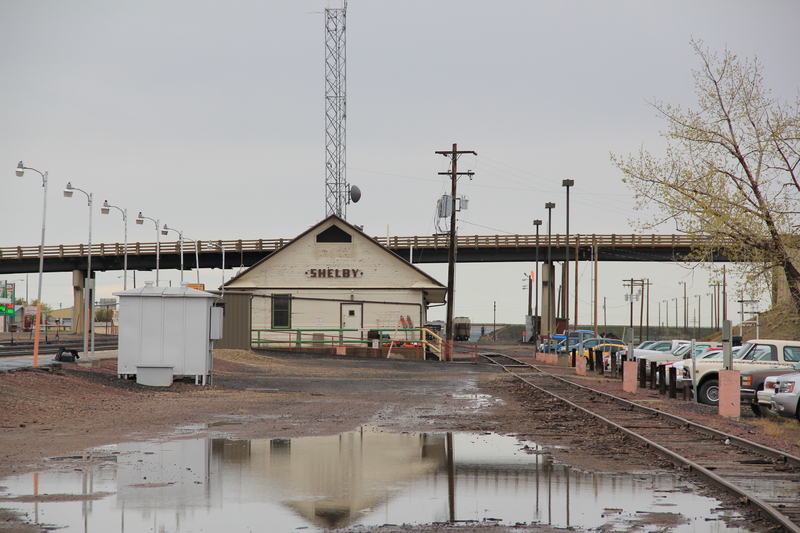 Stuck between the larger railroad towns of Shelby, a junction point, to the west and Havre, a division point with Great Northern maintenance yards to the east, the Great Northern never saw a need to invest in or to encourage investment in town development in Liberty County. 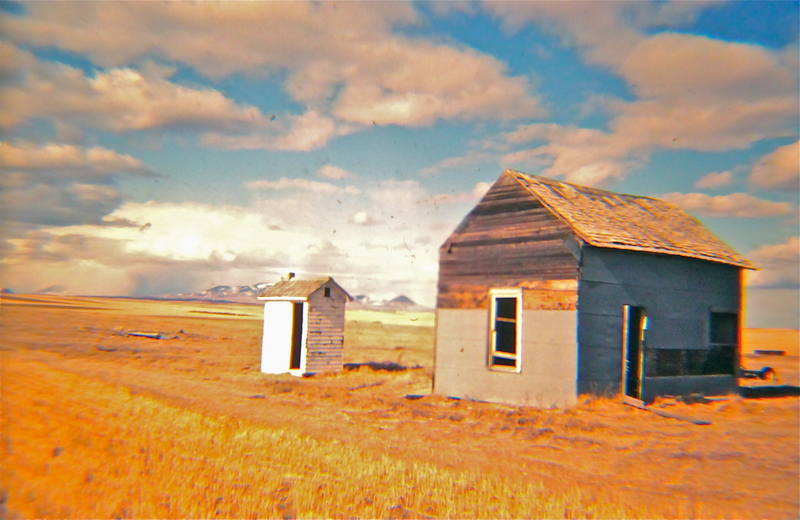 In the 1910s, hundreds of homesteaders flooded into the area: this 1984 image above of an abandoned homestead with the sacred Sweetgrass Hills in the background is one of my favorities. Today a little over 2000 people live in the county. 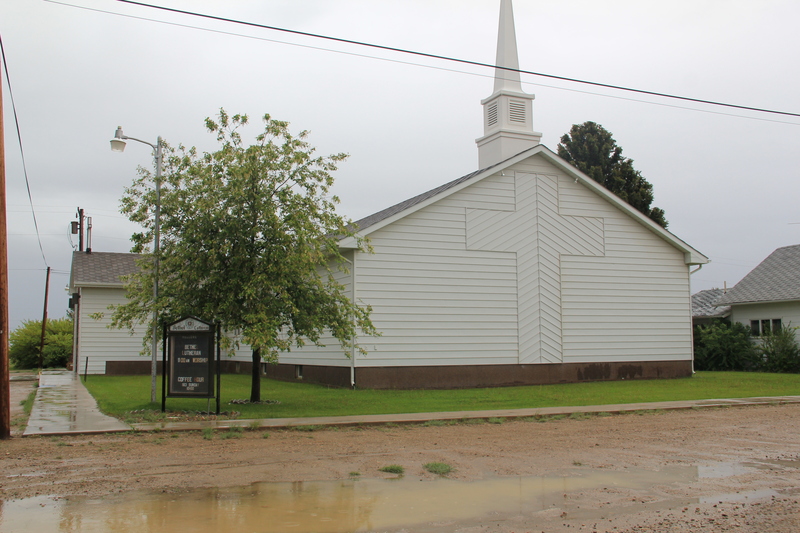 Lothair was the first town I encountered in Liberty County. 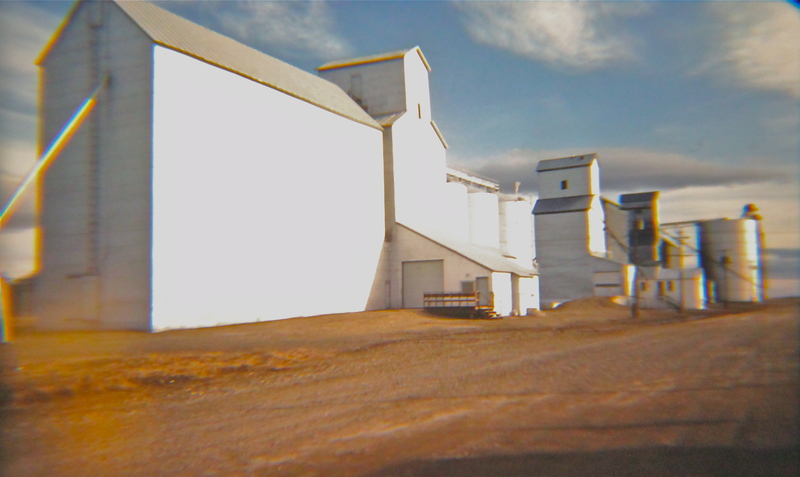 Its grain elevators called me off the highway in 1984; they remain landmarks today. 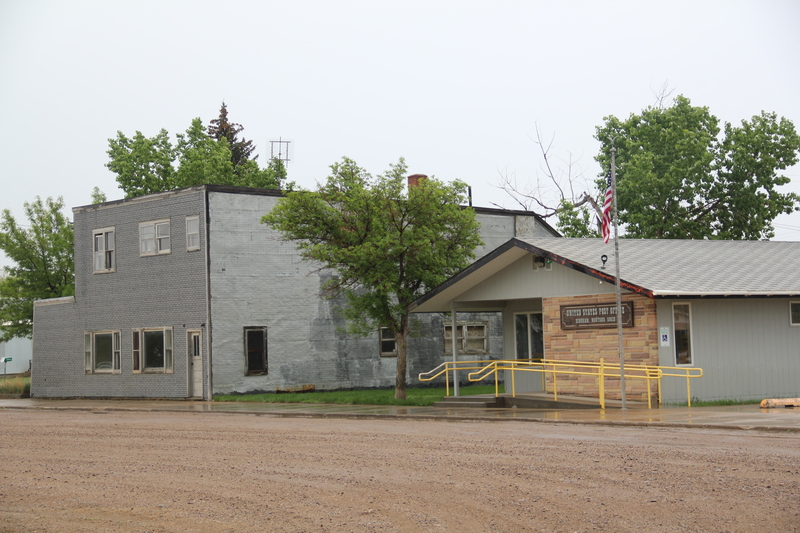 Nothing else much is there, although in the 1910s residents and nearby homesteaders petitioned the state railroad commissioners to force the Great Northern to treat their town more seriously. 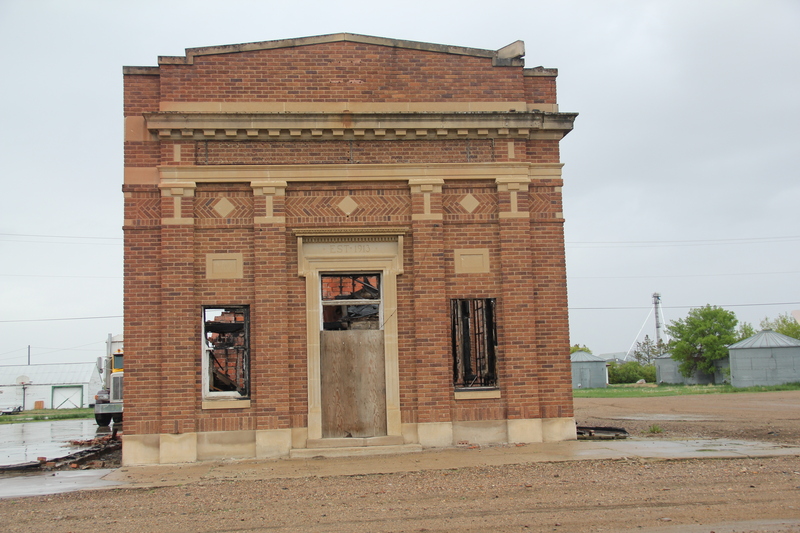 The 1918 petition, launched by the Lothair Commercial Club and others, called on the railroad to replace a depot that had burned in 1912. 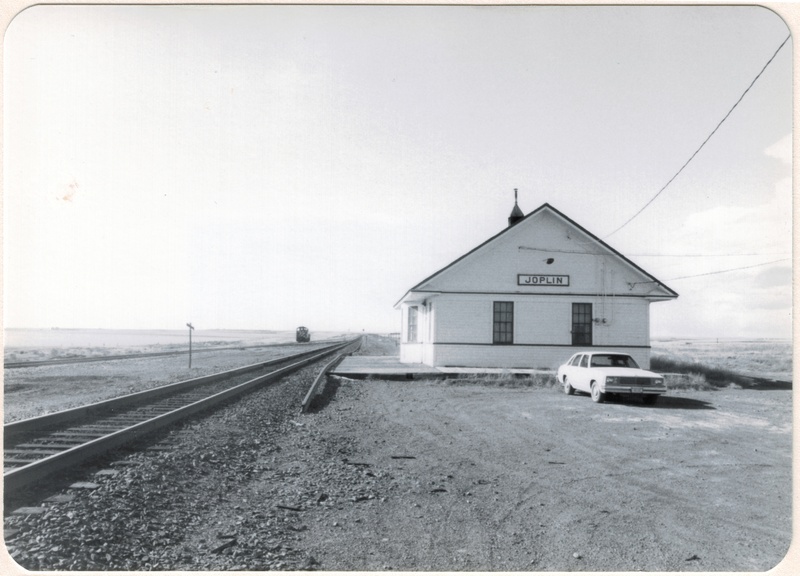 The residents complained that “the depot now in use is of the portable style 12×34 feet, which with a box car body for freight, constitutes the facilities for the handling of passengers, freight, baggage, and express, as well as for the housing of the agent and operator. . . . The waiting room is only of sufficient size to accomodate four or five people comfortably.” The petitioners argued that their town was at “the center of a very extensive dry land farming territory, nearly all of which has been filed on, but only about one-third is under active cultivation at the present time.” But the hopes of Lothair never survived the homesteading crash of the 1920s. Chester has fared better. 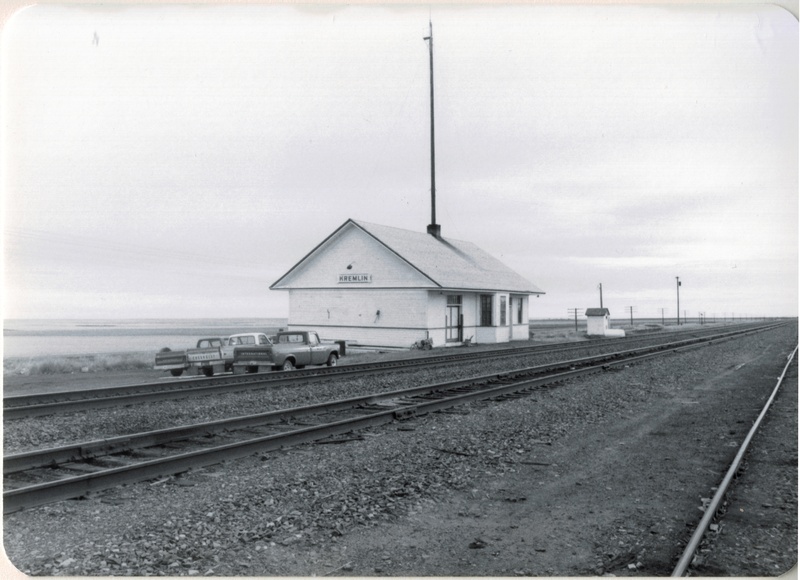 It retains a historic Great Northern depot, from the 1950s, although it was been moved from its earlier prominent location a bit farther to the east along the line. 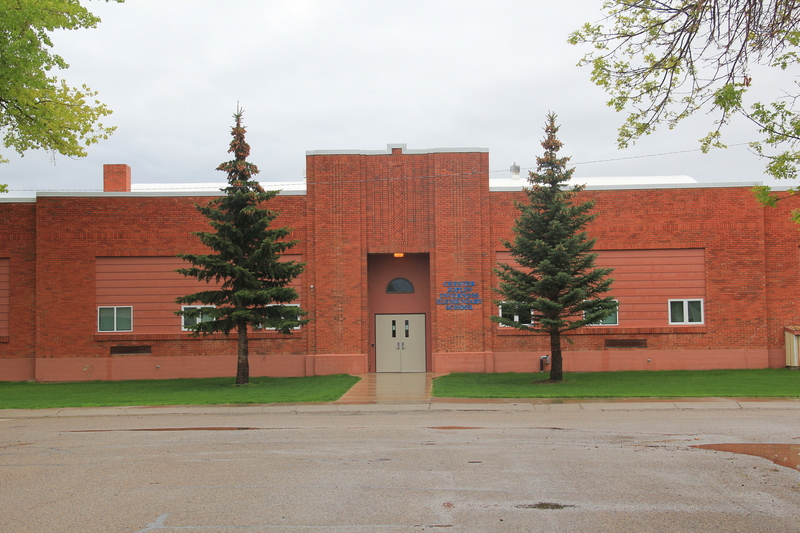 Chester has a T-town plan, with one attribute that I later found in other turn-of-the-century Montana railroad towns: an architecturally compelling two-story brick building on one corner, situated so its entrance faced both the tracks and the highway that paralleled the railroad. This building is the historic First State Bank of Chester (1910), one of two Liberty County buildings in the National Register of Historic Places. 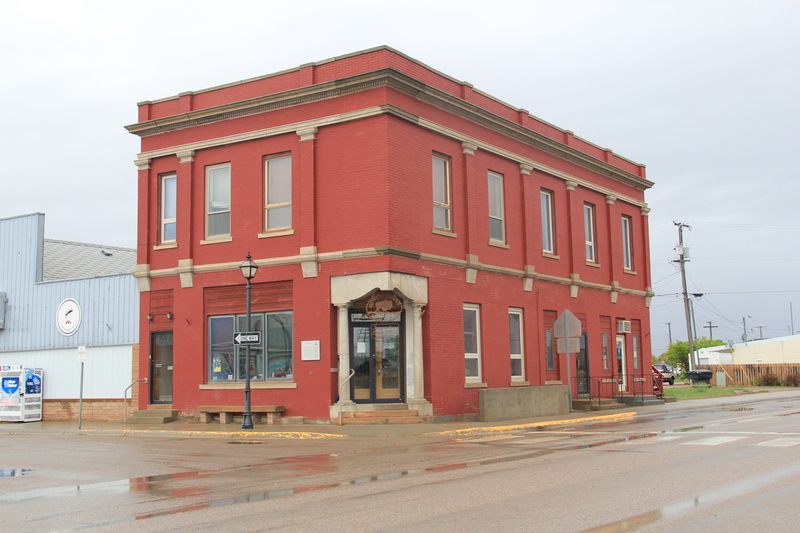 The bank closed in 1920, but the building remained important to the community, serving all sorts of function; a local high school class researched its history for the National Register nomination in 1997. The organization of space in Chester is interesting. 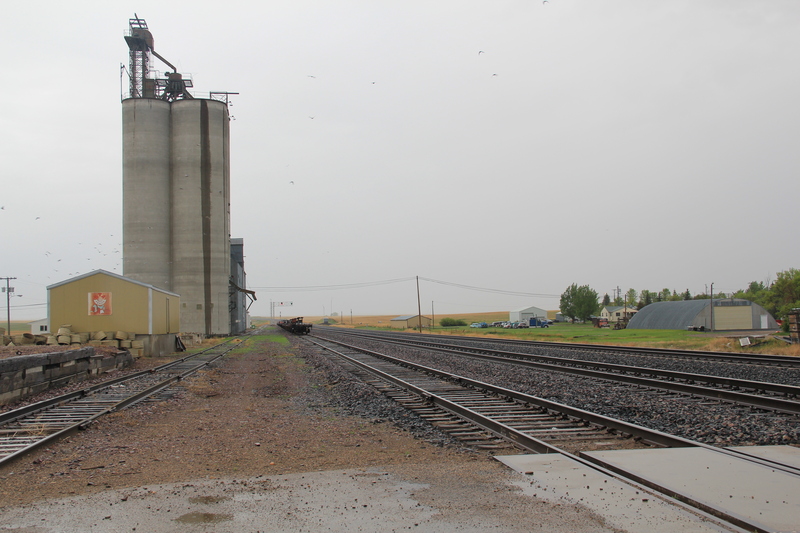 As typical of a T-town plan, the railroad corridor dominates the top of T with the tracks, elevators, warehouses, and railroad buildings. 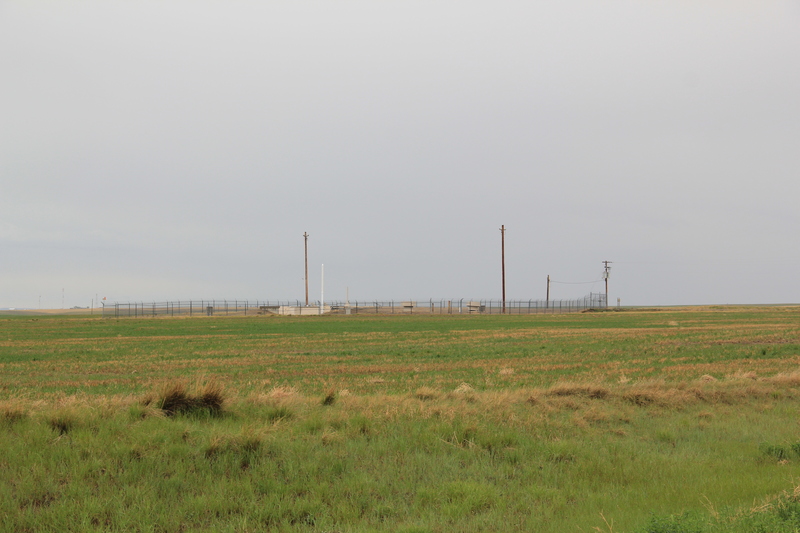 the Carter administration idea of a defense system where nuclear missiles would be moved on tracks over a huge expanse of land, creating uncertainty for enemy targeting of missile silos. 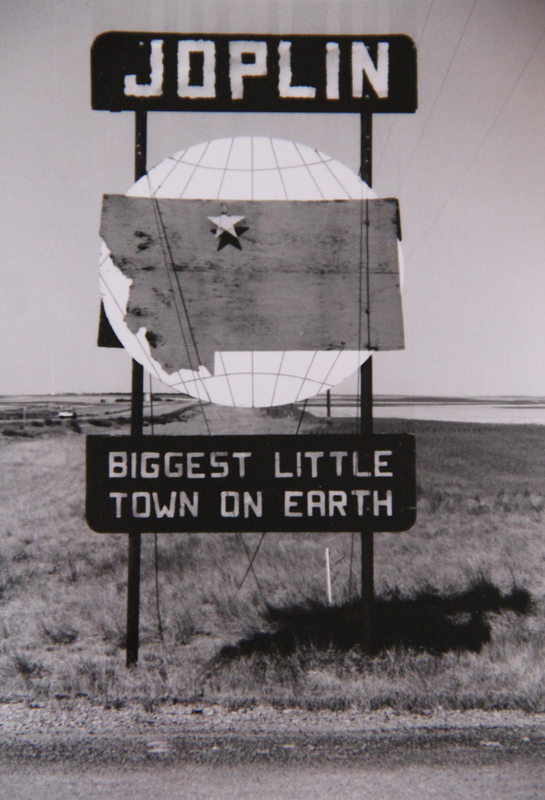 Liberty County had good reason to be excited about the MX–the time Chester had enjoyed sustainable growth was in the 1950s when the Bureau of Reclamation constructed the Tiber Dam/Lake Elwell project in the southern end of the county. 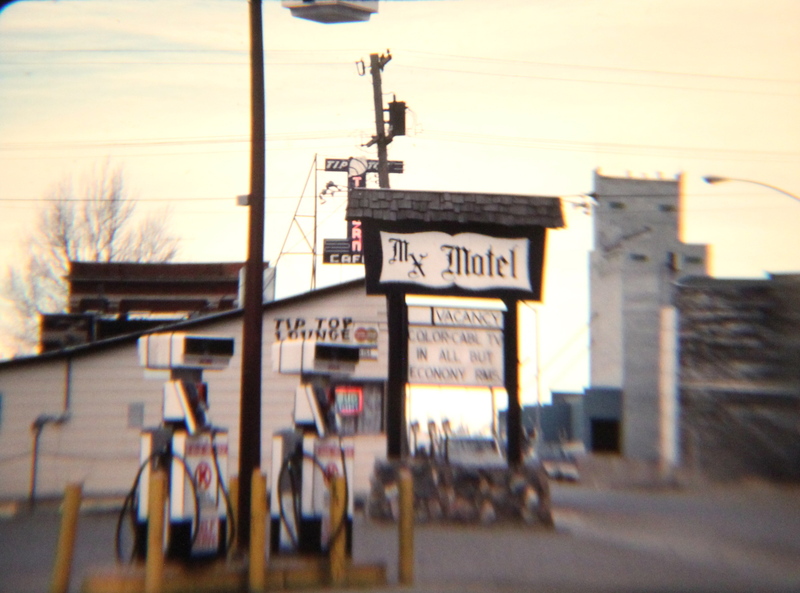 I stayed at the MX Motel in 1984–and never imagined it would still be there 30 years ago. It remains, but I wonder if anyone recalls why the name MX made sense to Liberty County in the past. The stem of the T-town plan in Chester is also interesting. 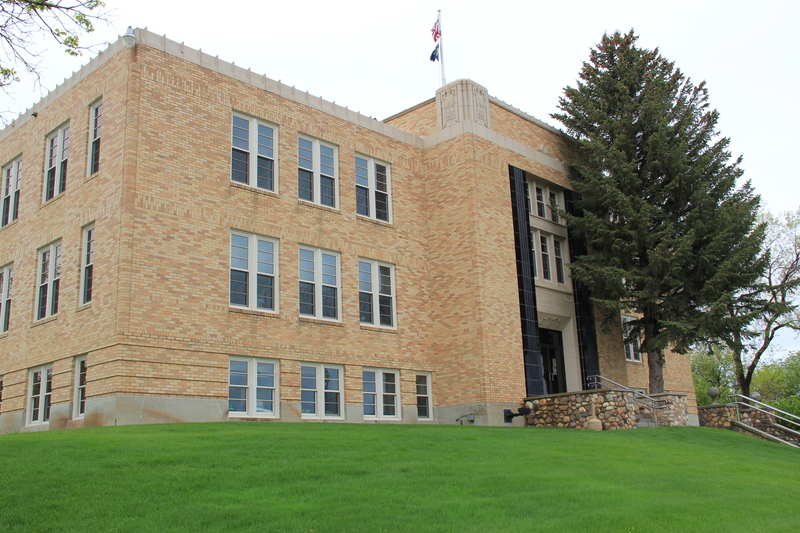 The bank is the visually prominent element while the county courthouse is a large two-story brick facade a bit farther down the street. 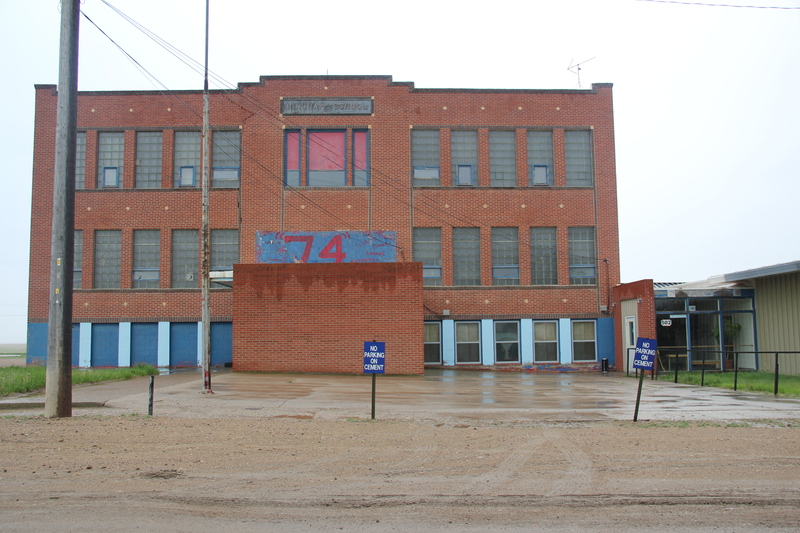 At the base of the T is the school campus, a sprawling group of brick Art Deco-influenced buildings (1935 for the Art Deco elementary school; the high school building dates to 1952) that now serve students with three old railroad towns: Chester, Joplin, and Inverness, and the school nickname is the Hi-Line Hawks. 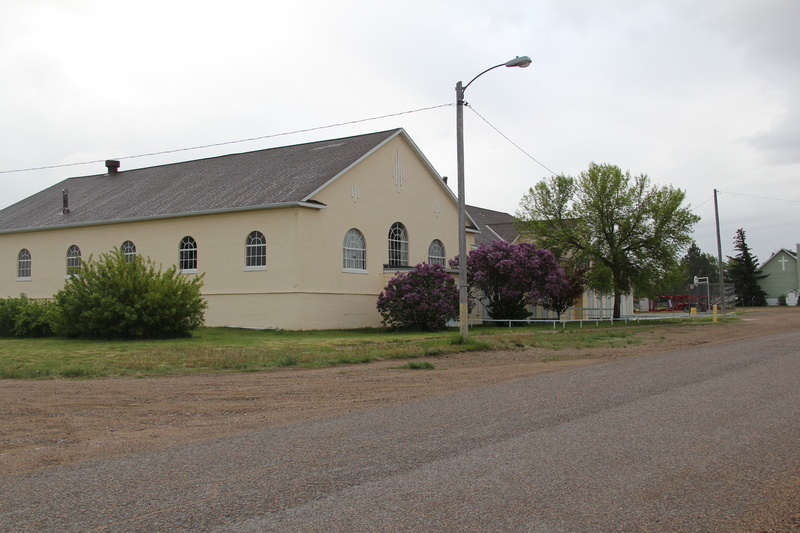 Located between the commercial district and the school is the National Register-listed First Episcopal Methodist Church (1911-1968); it became the county museum in 1970, and soon will have served that cultural function for longer than it was a church. 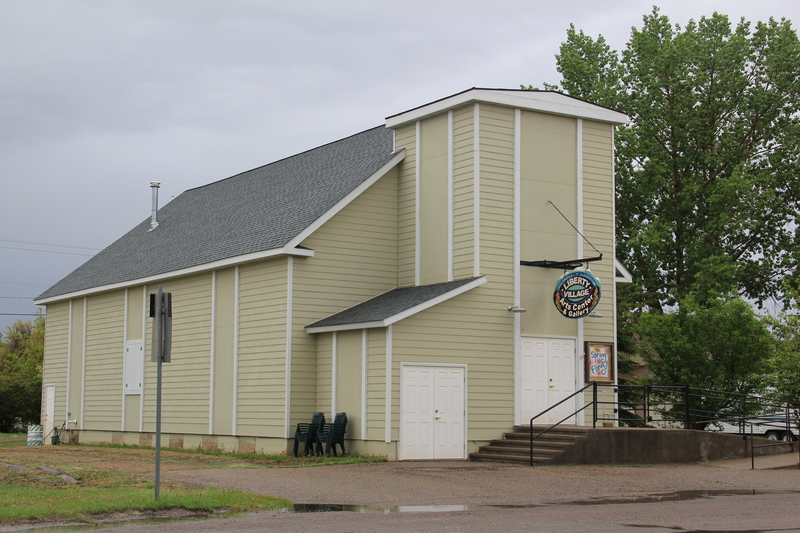 A much more recent yet still appropriate adaptive reuse is the conversion of another church into a county arts center. 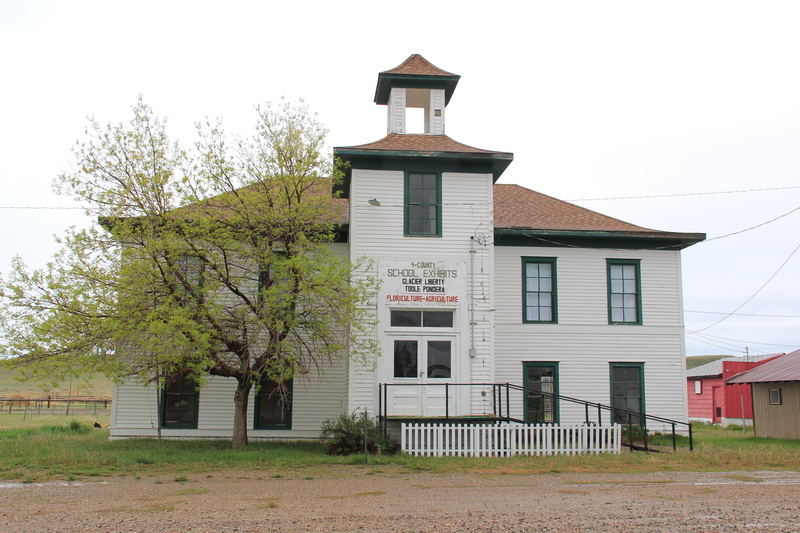 This portion of Montana has actively pursued cultural tourism in the 21st century and the arts center plus the earlier museum are parts of that effort. 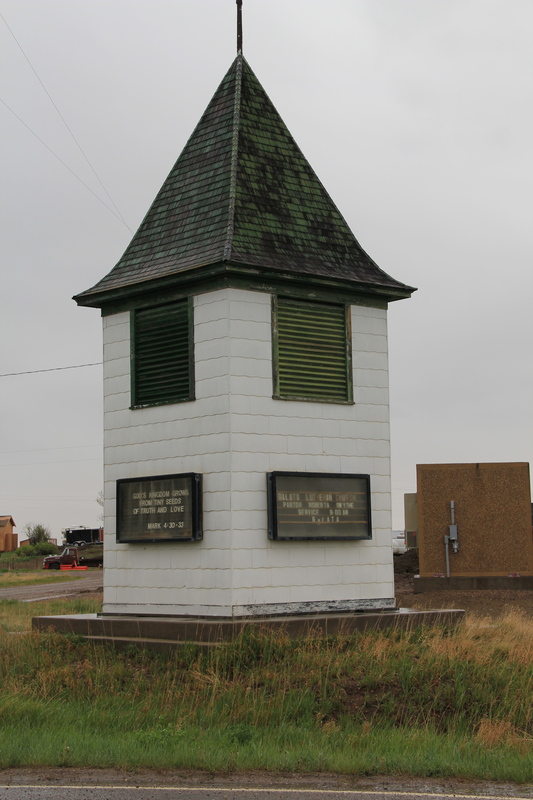 As soon as you move east of the historic Shelby visitor center on U.S. 2, you encounter the landmarks that physically mark the region’s agricultural character. 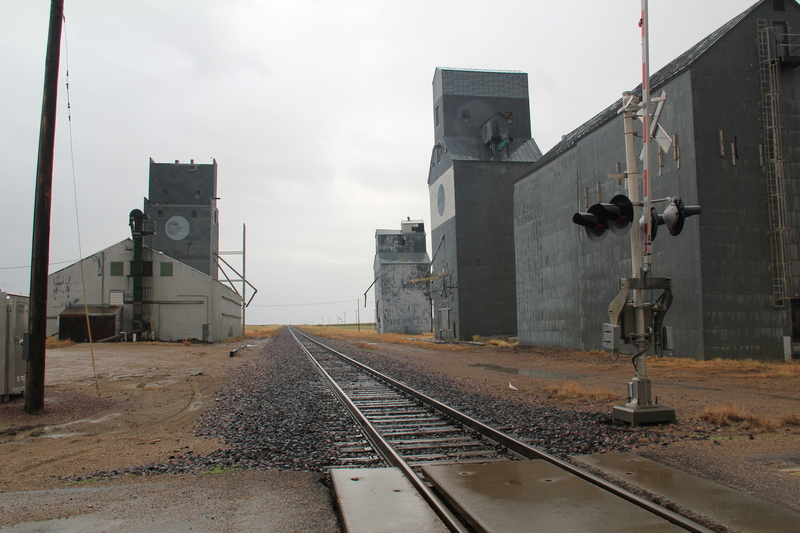 On the north side of the highway, immediately adjacent to the tracks are complexes of grain elevators. 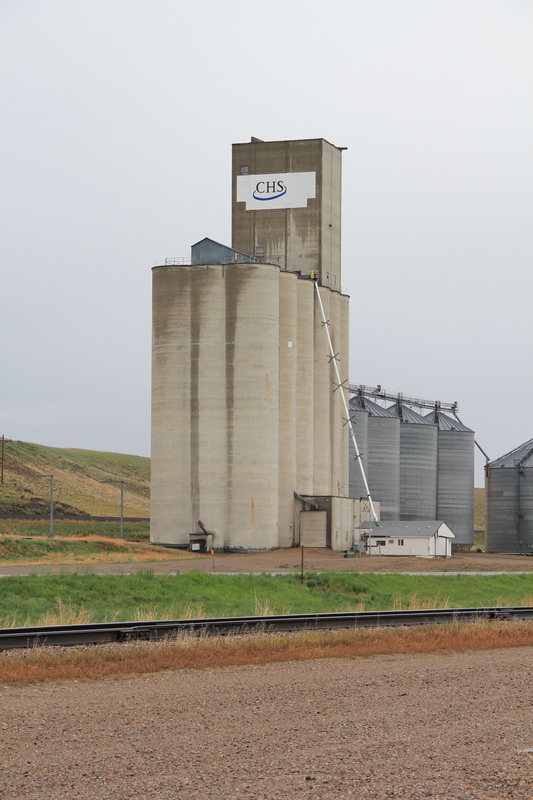 Here at Shelby there is a tall concrete group of elevators run by CHS–the appearance of concrete elevators always mark a town that has experienced economic growth in the second half of the twentieth century. 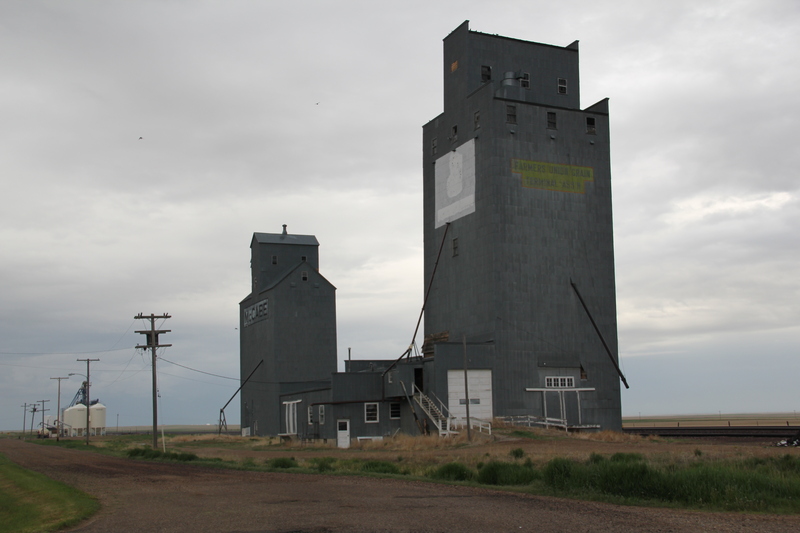 Many of the smaller Hi-Line towns have the classic frame elevators of the homesteading era. 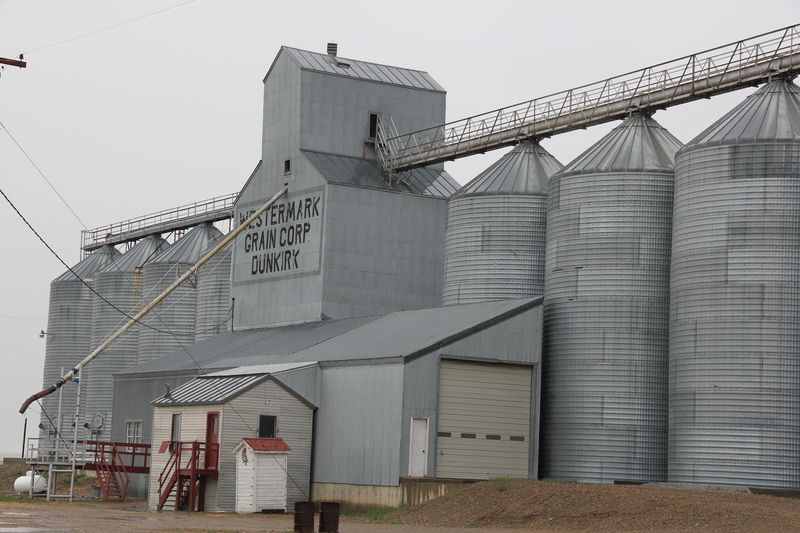 Grain elevators thus become a physical barometer of a place’s economic prosperity and development. 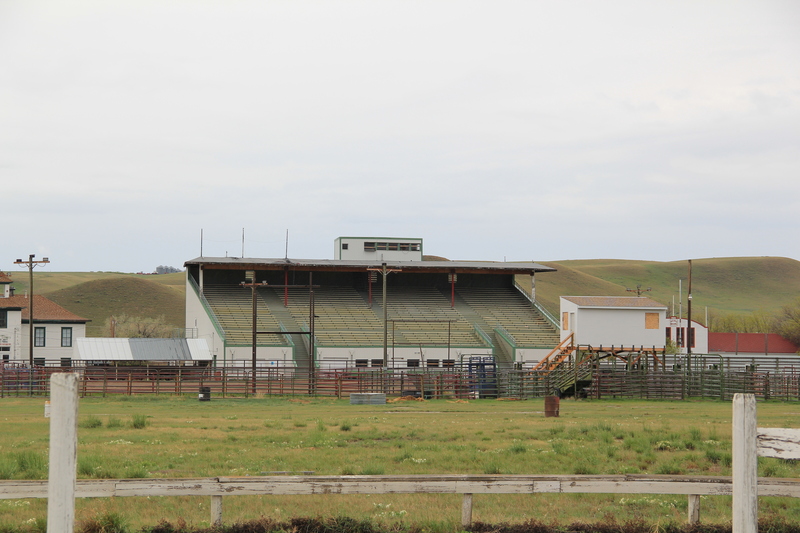 On the south side of the highway in Shelby is the second crucial agricultural institution, the county fairgrounds and rodeo arena. Livestock is not only important to the economy but maybe even more important to the culture of the region. The Marias 4 County Fair, held the third week of July, is a regional gathering of no equal. 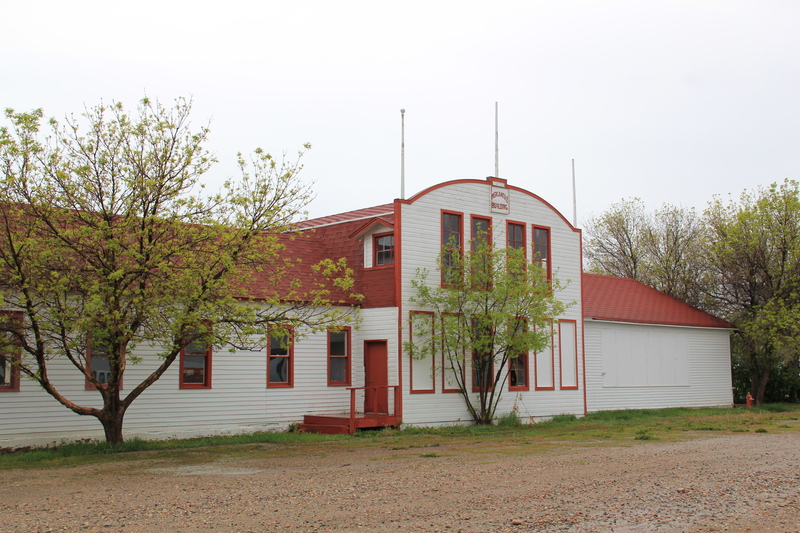 Thousands attend, and they do so at a fairgrounds with an impressive collection of historic buildings. 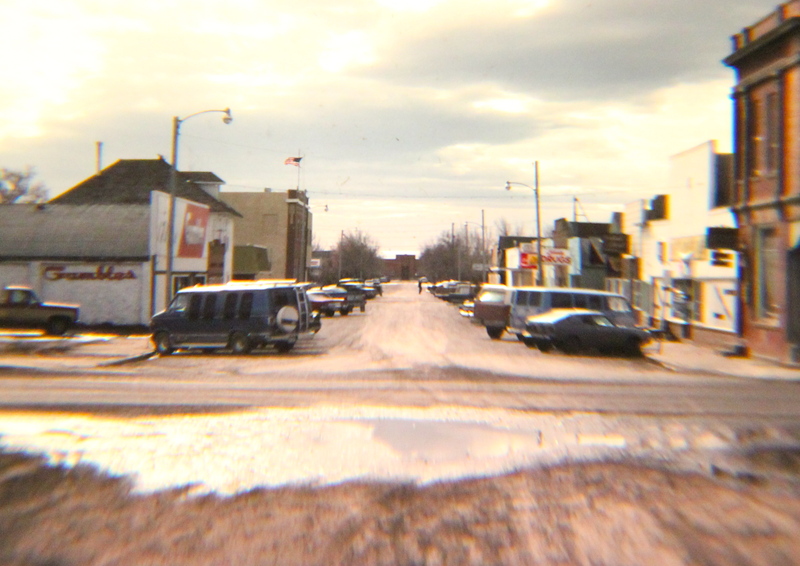 In 1984, I noted this east side of Shelby as I left the town, but my eyes and camera were focused on the small railroad towns that I would next encounter, along with two important historic sites I wanted to document. 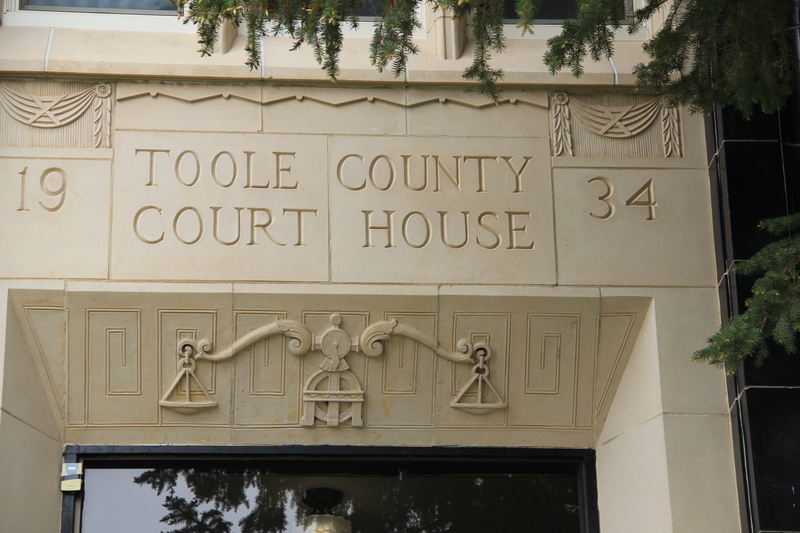 The first was the Whoop-Up Trail remnant, a site first documented by state archaeologists in 1968 and among the handful of historic properties then identified in Toole County (another section of the trail near Kevin is listed in the National Register). 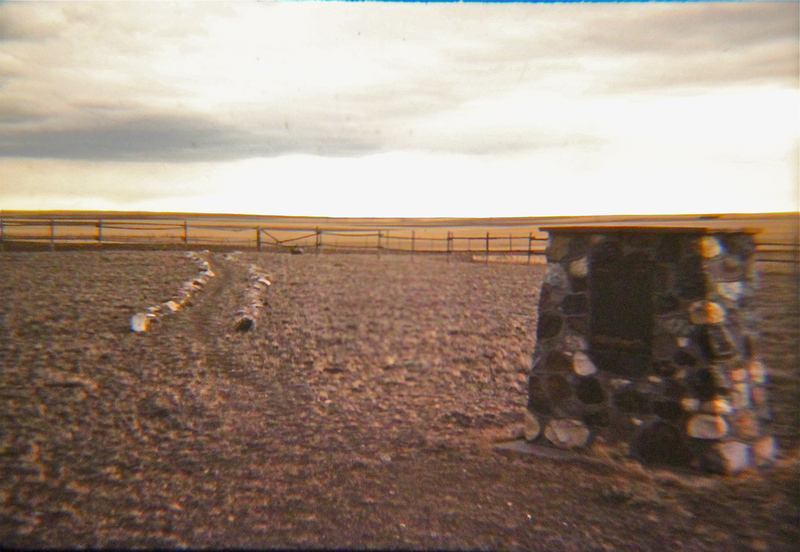 In 1984 the location along the highway was well marked, with a series of stones marking the trail and encouraging visitors to go to the property edge and look into the Marias landscape where this historic route between Fort Benton and Fort Whoop-Up in Canada once passed. 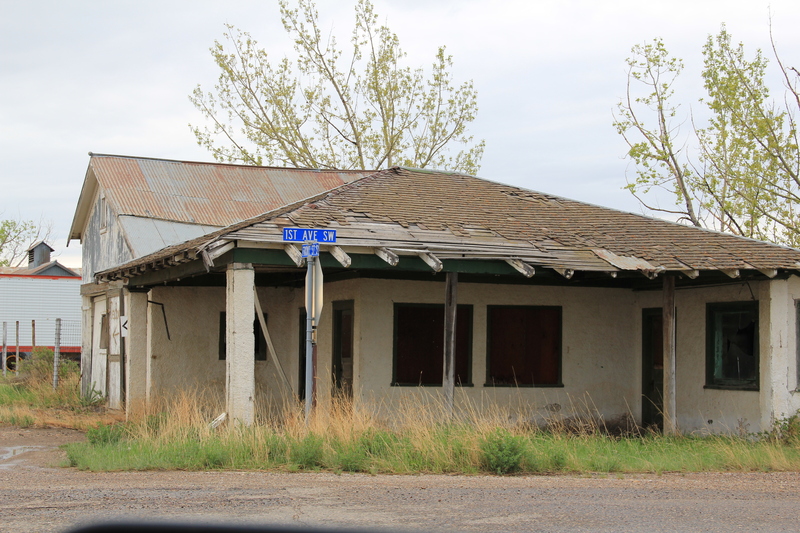 In fact to the south of U.S. 2, a county road still crosses the Marias near the old trail crossing: it was a somber, beautiful place in 1984. 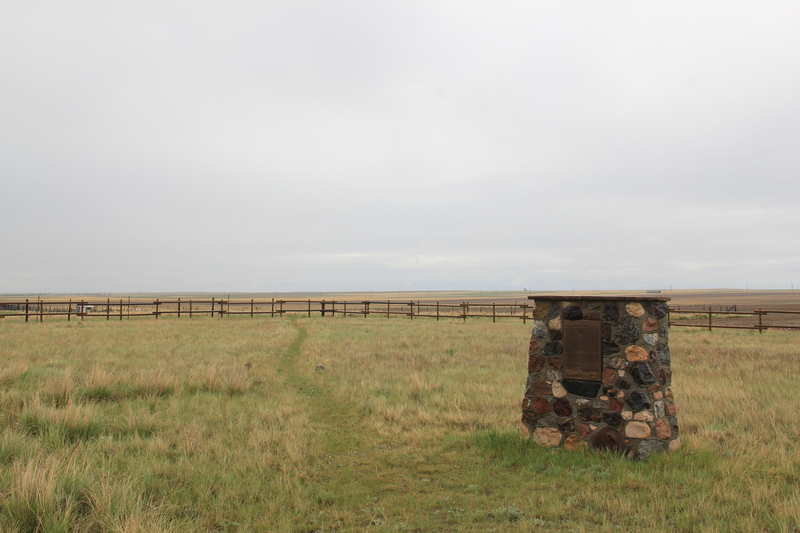 In 2013, the Whoop-Up Trail site is still maintained, put the line of stones to mark the path has either been taken up or covered by growth. 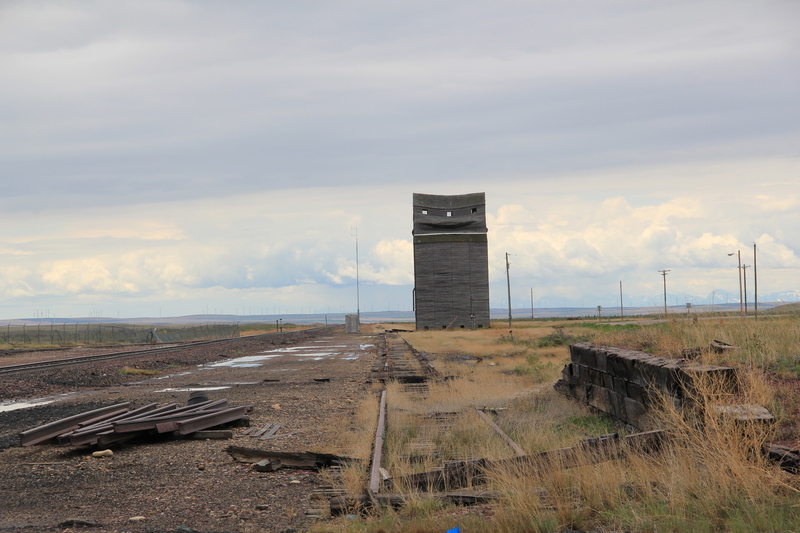 Across the highway remains another key landmark of the Hi-Line and Central Montana region: a nuclear missile silo. 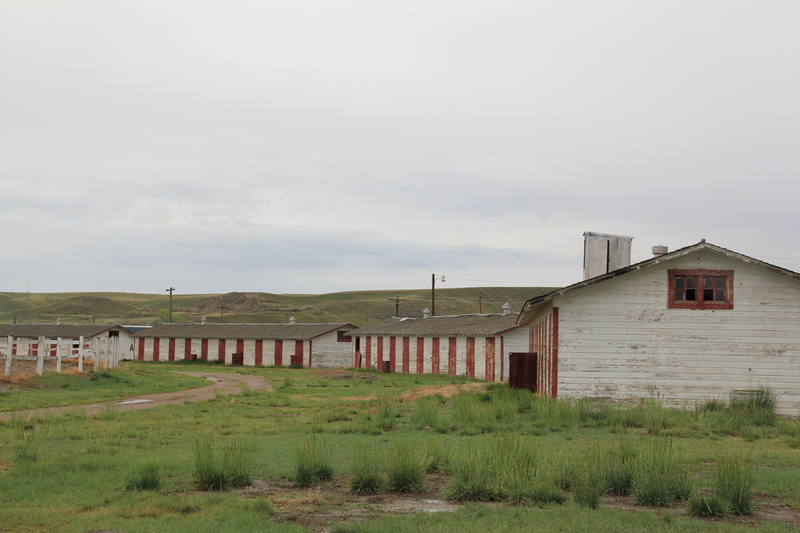 These military bases are everywhere it seems, and sometimes in the most unlikely places. 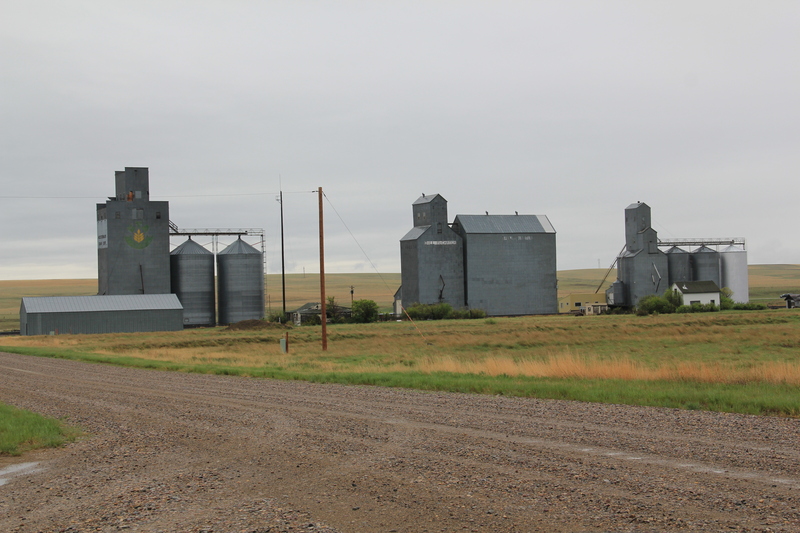 By 1984 I had become somewhat accustomed to their presence–coming from the South I had no idea of the role Montana played in our nation’s defense. 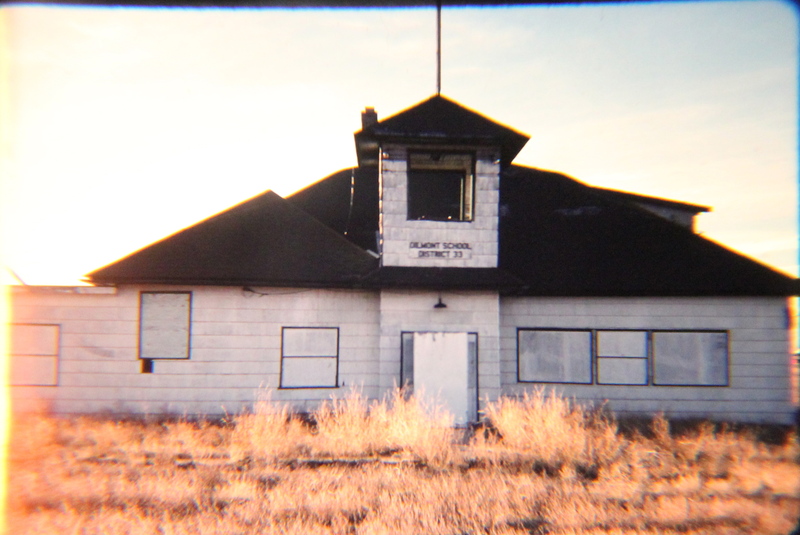 But the missile silo was a surprise: what I really was seeking was something on the Marias River–or Baker–Massacre, one of the most horrific events of Montana’s early territorial period. 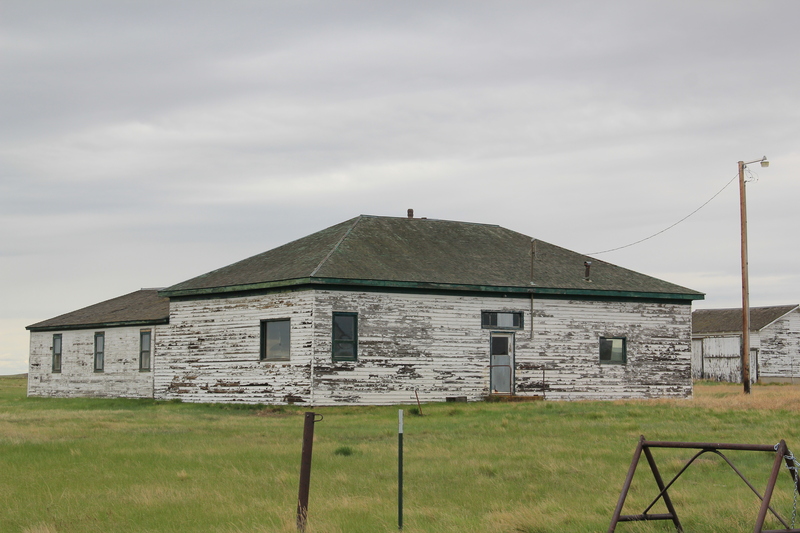 The site is east of Shelby and south of U.S. 2 on private ranch land–and the family has been excellent stewards of this place. No need for me to tred on such sacred ground, but there is a need to intepret that story, and to tell visitors and residents that here in this seemingly peaceful beautiful countryside a group of territorial citizens murdered Blackfeet women, children, and elderly in some sort of mindless bloody search for revenge. That story wasn’t told in 1984 but a long text marker does so now. 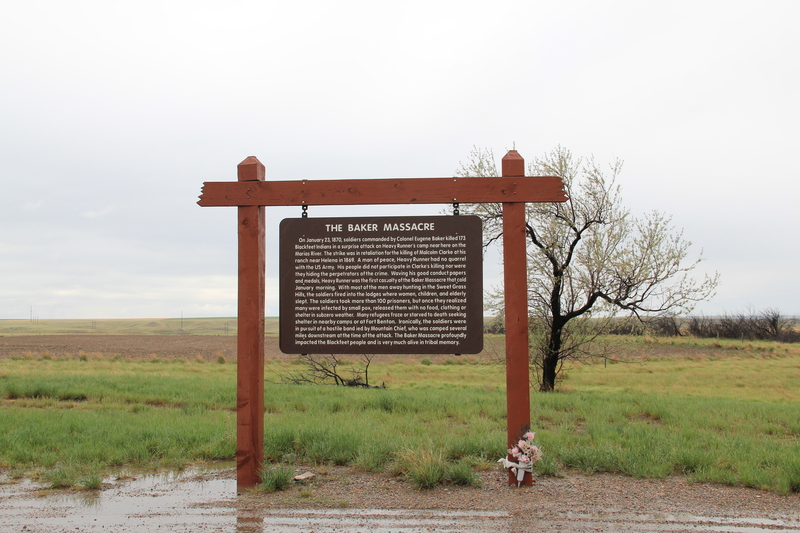 It strikes the right message: that the massacre “profoundly impacted the Blackfeet people and is very much alive in tribal memory.” A small bouquet of flowers at the marker’s base in 2013 testifies to the truth of this simple memorial. 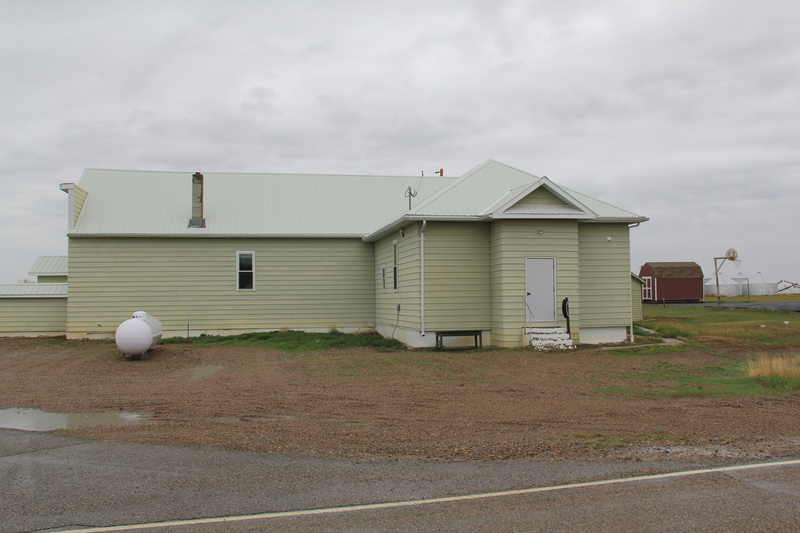 Dunkirk, the first of a trio of Toole County railroad villages east of Shelby, was too close to Shelby itself to ever maintain its own identity for long. 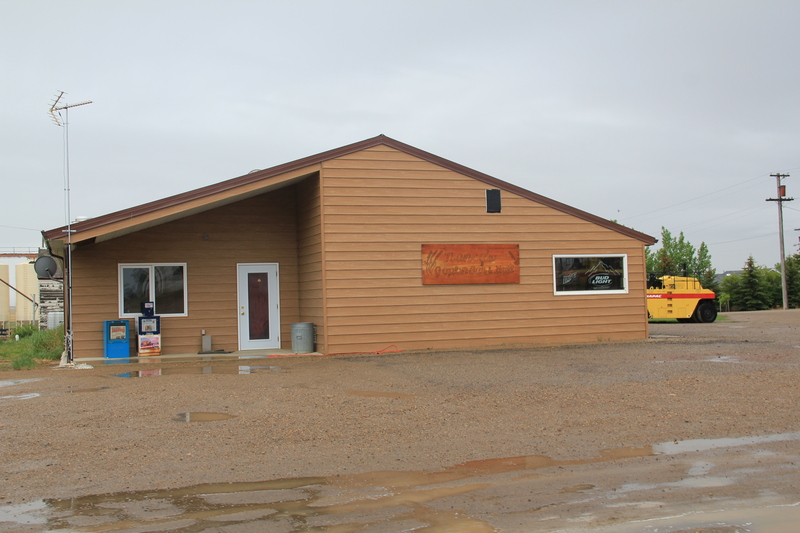 Its Frontier Bar was long a worthy roadside stop for thirsty travelers. 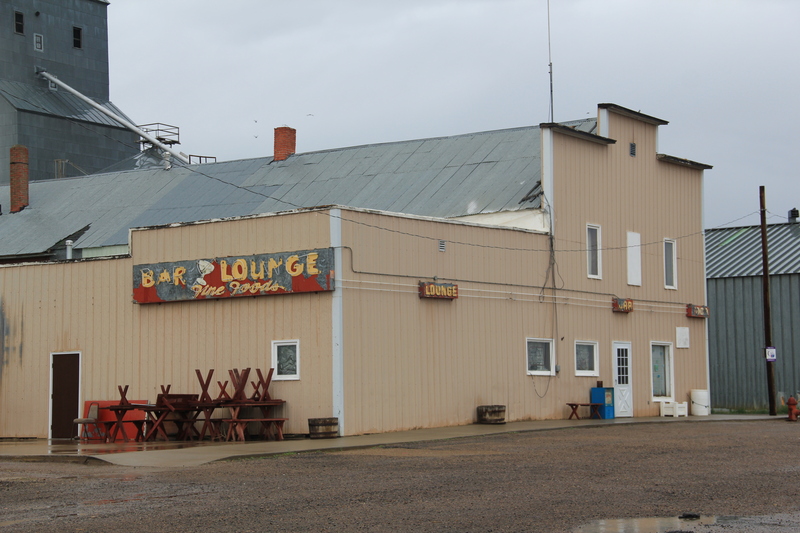 Outside of the Westermark Grain Corporation elevators, the bar was the only reason to even give Dunkirk a glance. 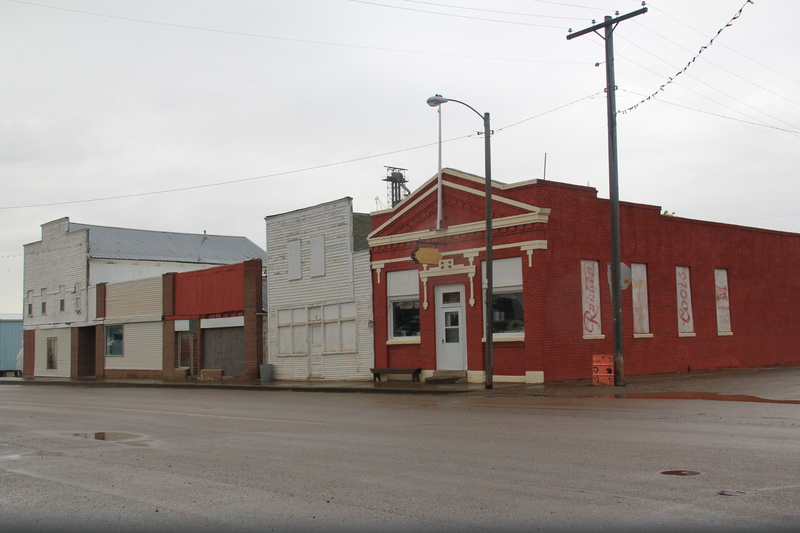 Devon is a plains country town on the Great Northern Railway that was the first “prairie ghost town” of the 1984 survey. 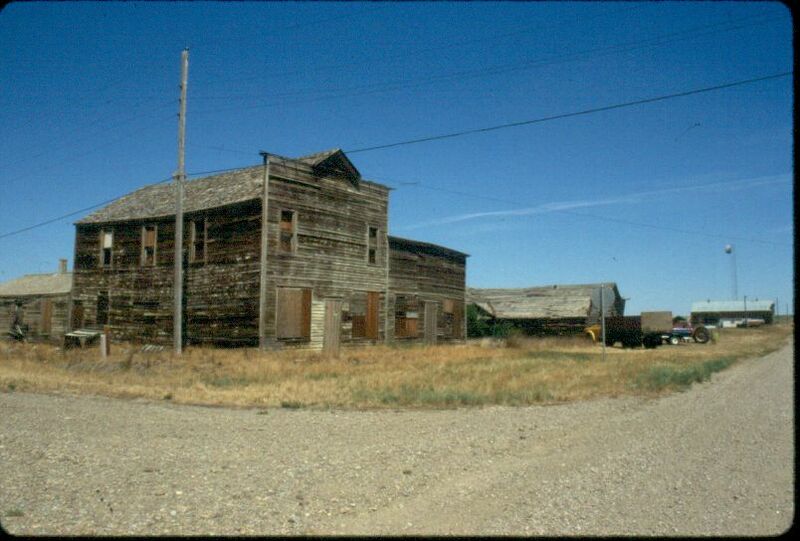 Numerous false-front frame buildings from the 1910s and 1920s existed in 1984: 30 years later several of these were gone. Yet I must admit that Devon now had more to it than what I recalled from 1984. 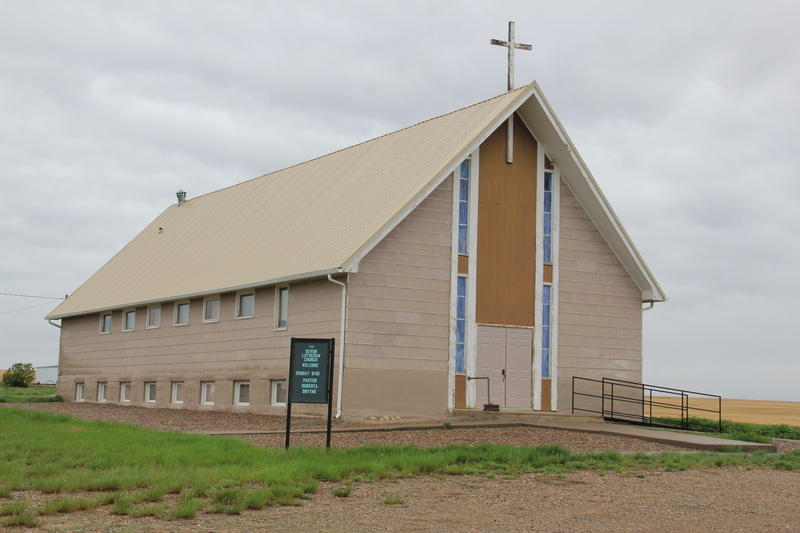 Certainly the old brick bank building had been abandoned, and the town community hall appeared shuttered, but the contemporary-styled Devon Lutheran Church spoke to persistence, even after decades of economic change. 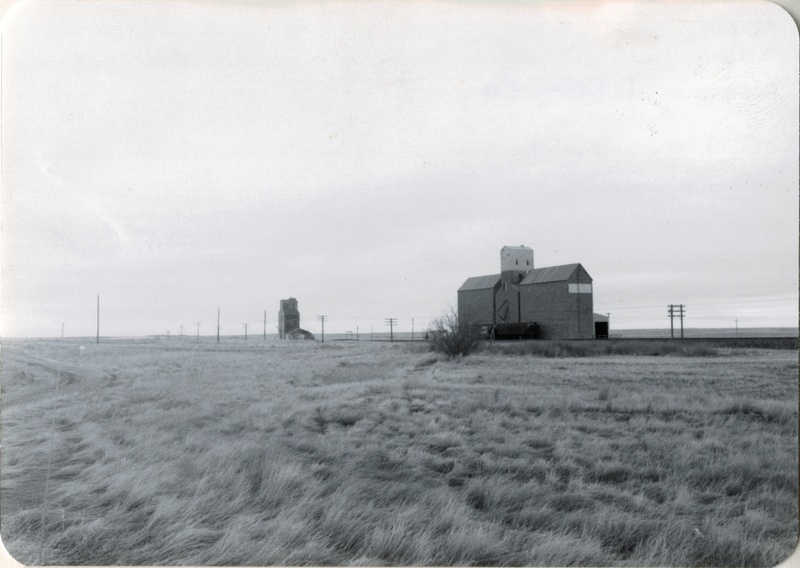 The grain elevators that were prominent in 1984 also had persisted, and stood as three sentinels on the plains. 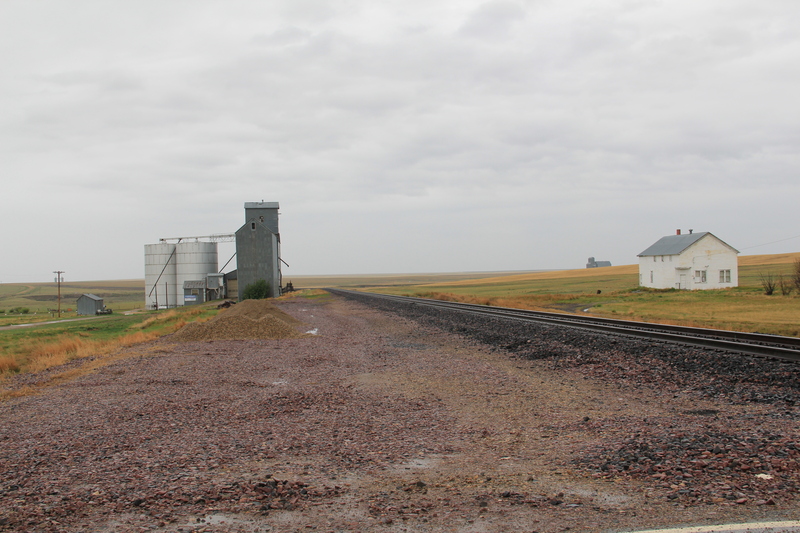 Galata, established in 1901, is another Great Northern Railway stop, with its corridor landscape speaking to its isolation and agricultural dependence. It is a T-town plan town, where the main street forms the stem of the T while the railroad tracks form the top of the T.
In the latter half of the 20th century, Galata had actually reached beyond its T-town plan and out to the highway. 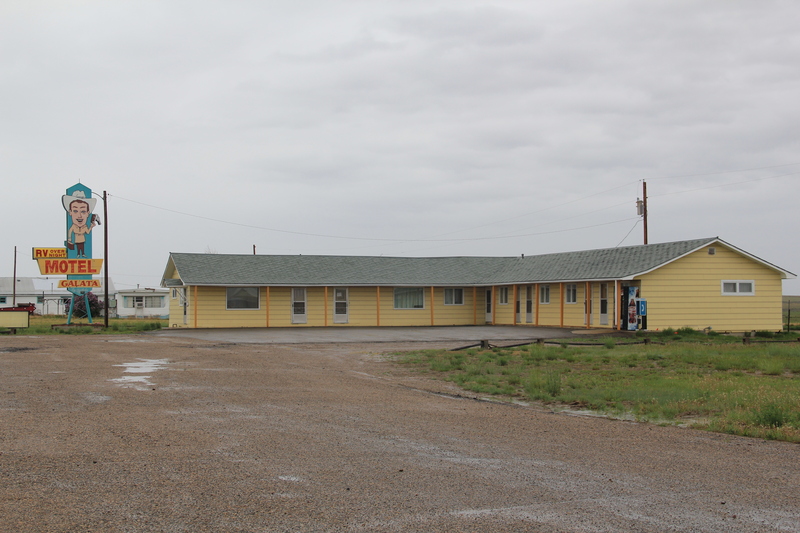 Its Motel Galata is a classic piece of roadside architecture, and its huge highway sign of a Montana frontiersman with cowboy hat waving his car keys beckoning travelers to stop. school. 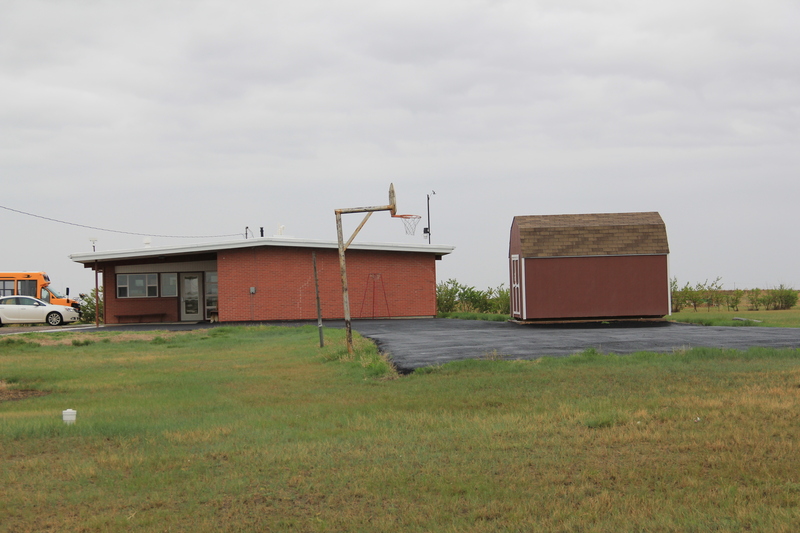 The school campus contains two eras: the classic frame country school of the homesteading era, with additions, and then the more ranch-styled flat roof school building common in American suburbs in the 1950s and 1960s. 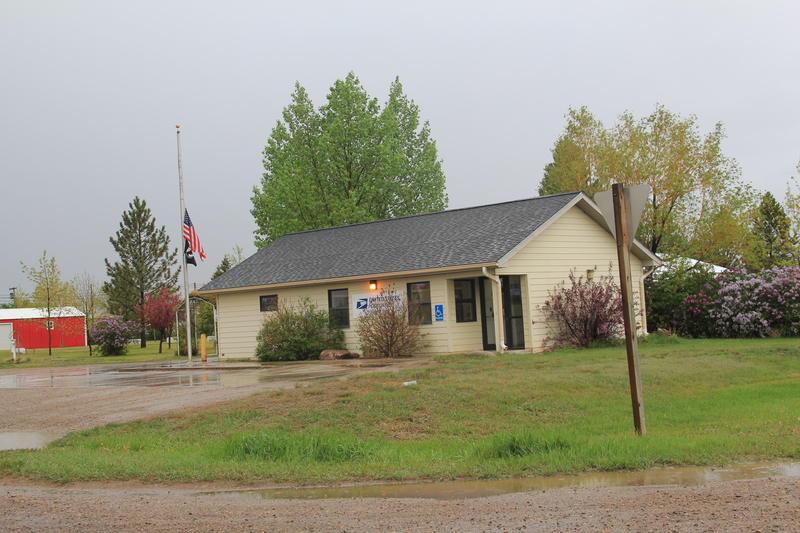 As discussed earlier in this blog, Hi-Line residents also make their presence known by signs, even if they are a little worn or emblematic of the loss of other community buildings. Galata is no exception. Toole County, second day: As I ventured out from Shelby into Toole County in February 1984 I followed old US Hwy 91 route (surpassed then as now by I-15) into an early 20th century oil patch region–the Kevin-Sunburst field–that had been discovered in the 1920s during Montana’s initial oil boom, but had dried up until the 1950s, although limited production remains even today. In 1984 everyone in Helena thought that I should give the region a look for early resources associated with the oil industry. Better stories in 2013 awaited me in Kevin, to the west. 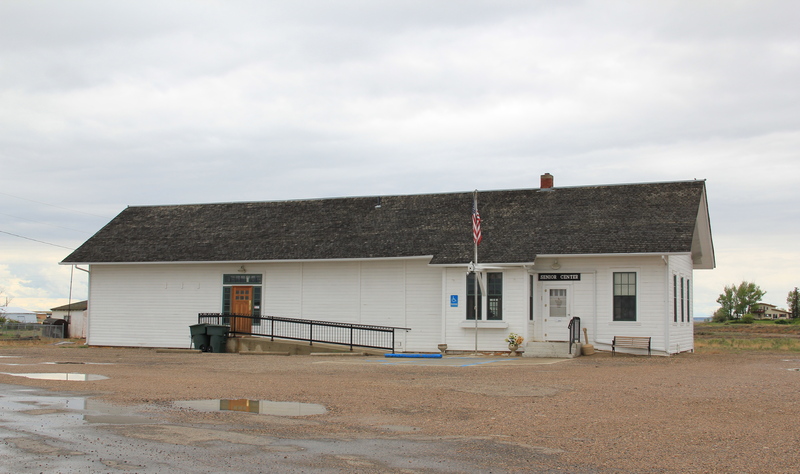 Here the historic Kevin depot, which is listed in the National Register, had been moved off the tracks, but it had been converted to a community center and senior citizens center, a very appropriate and successful adaptive reuse. 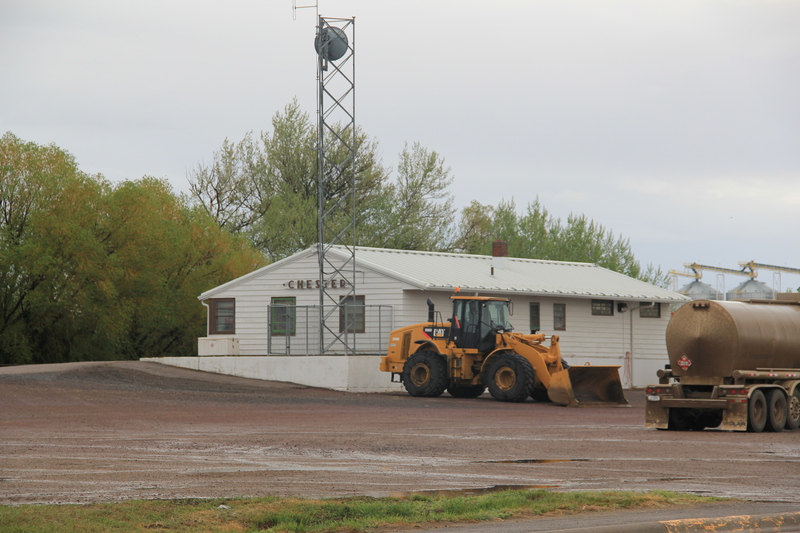 The town numbers under 200 residents and their commitment to keeping this connection to the town’s railroad roots along this spur line alive and well is commendable. 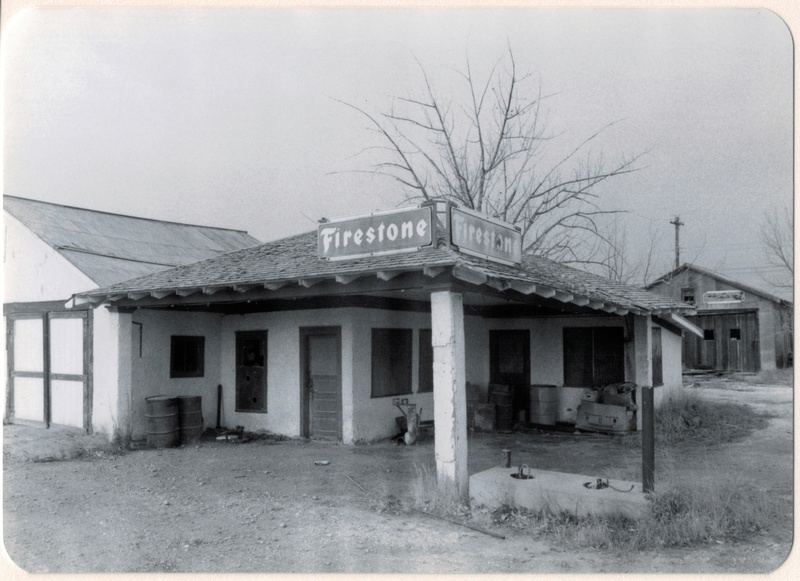 Also in Kevin in 1984 a circa 1930 service station caught my eye, with especially the period “Firestone” signs. 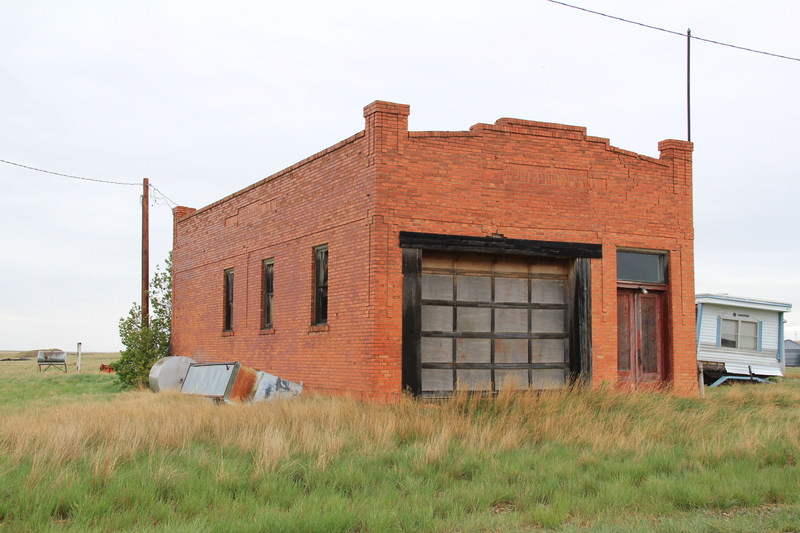 Rather amazingly the building still stands at the town’s prominent corner, although the roof is sagging and its original function is more difficult to discern today. 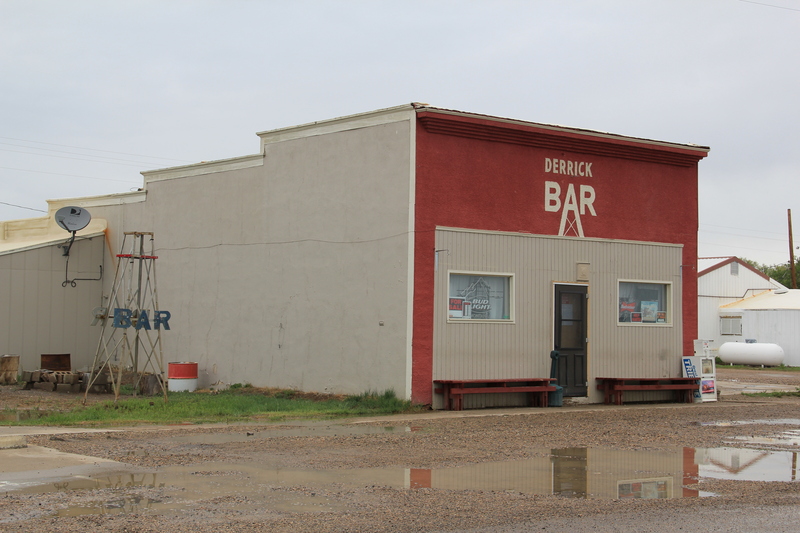 Another favorite building in 1984 was the Derrick Bar, a friendly place where the very name spoke to what was happening in Kevin in the mid-20th century. 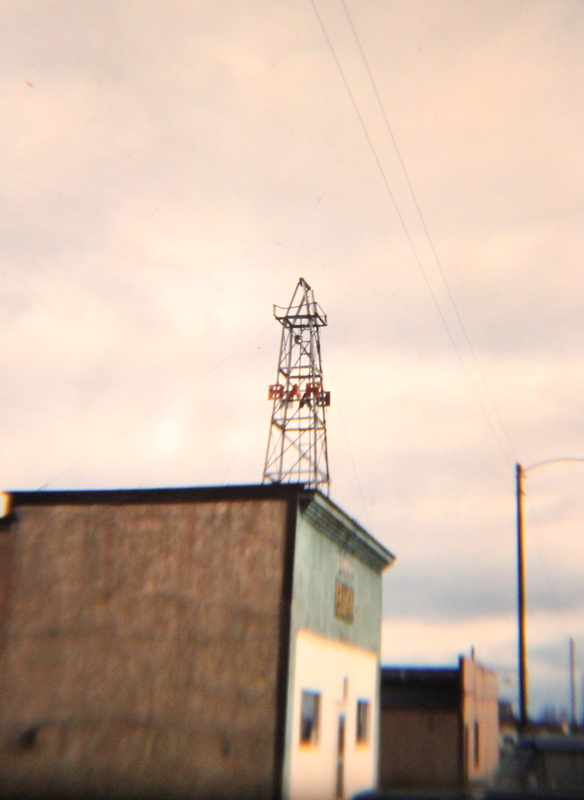 Its miniature derrick sign, on the top of the building, was a beacon; unlike anything else I would see in Montana. 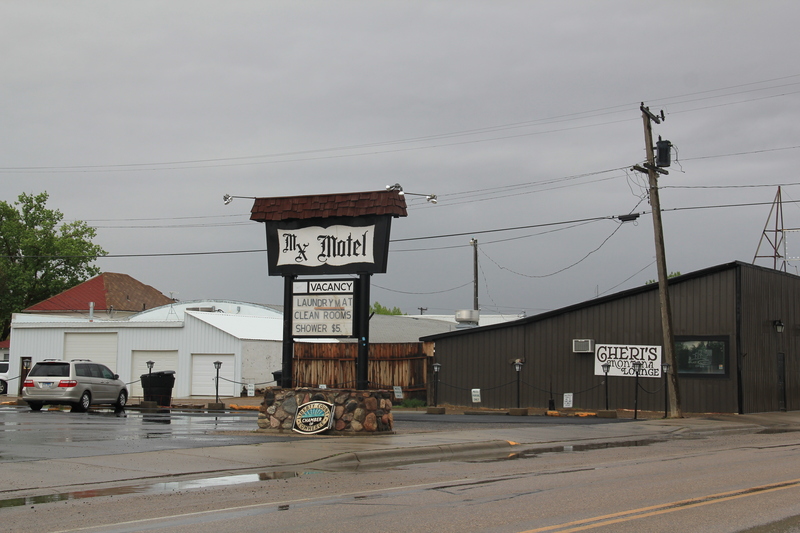 The bar is still there–still friendly too–but the derrick had come off of the top–although it too was preserved on the side of the building. 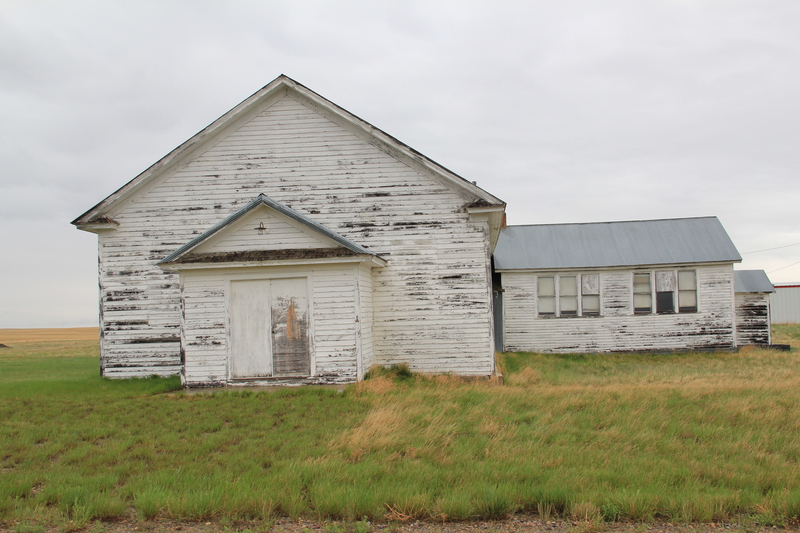 Kevin-Oilmont was a section of Toole County that had promised untold wealth in the 1920s and 1930s–and the boom at the Kevin-Sunburst field helps to explain the strong imprint of 1930s modernism in Shelby. 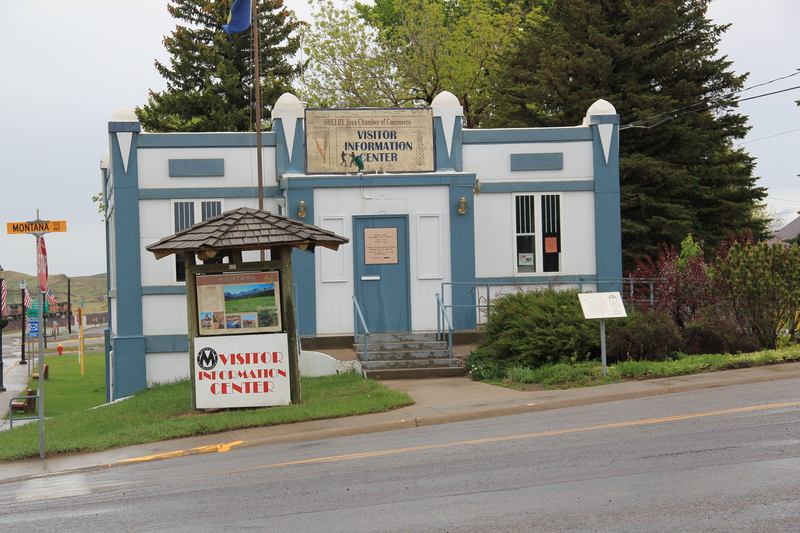 The most important Jazz Age building in Shelby is the visitor center, from 1923. 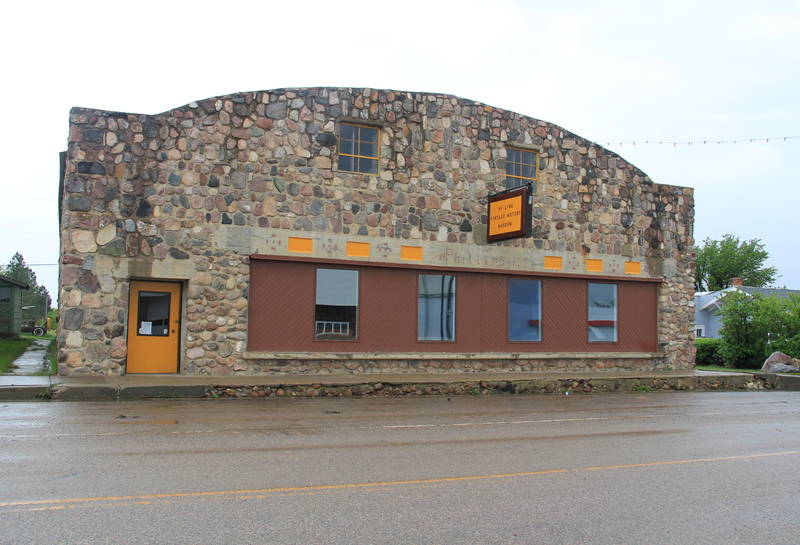 Listed in the National Register, the building served as the local headquarters for the city’s ambitious attempt to host a world’s heavyweight fight between legendary boxer Jack Dempsey and Tommy Gibbons. 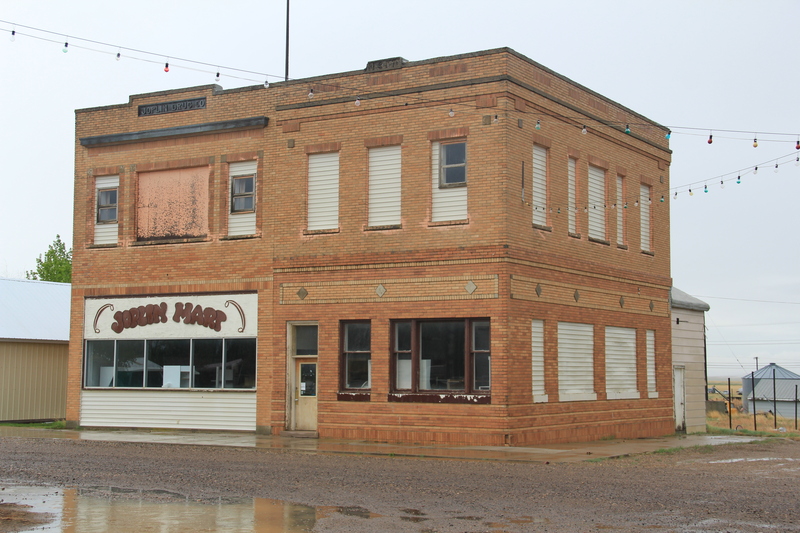 Flush with oil money, town boosters thought the fight would put Shelby on the map, but the projected tens of thousands of spectators never materialized–only 7,000 made it to Shelby–and the event bankrupted the town. 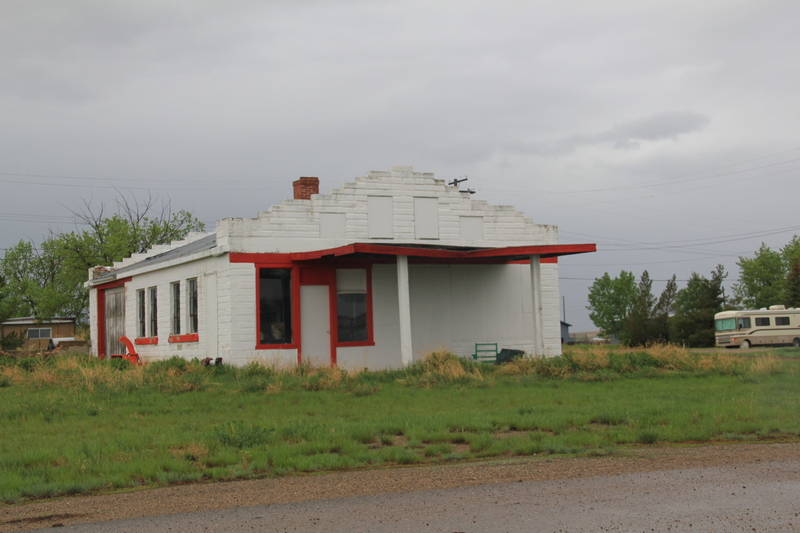 At the western end of the historic downtown is another National Register landmark, the Rainbow Service Station. 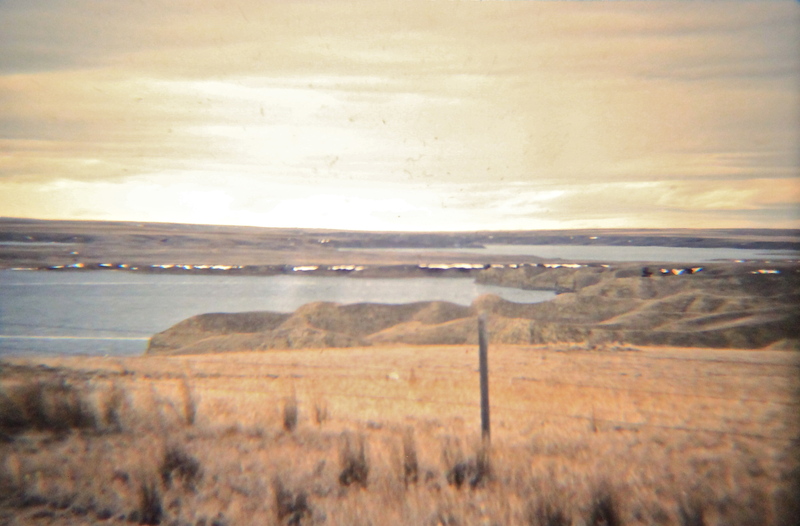 The development of U.S. 2 as the region’s key east-west automobile/truck corridor happened at the same time as the oil boom, and as auto travel to Glacier National Park also was growing in numbers. 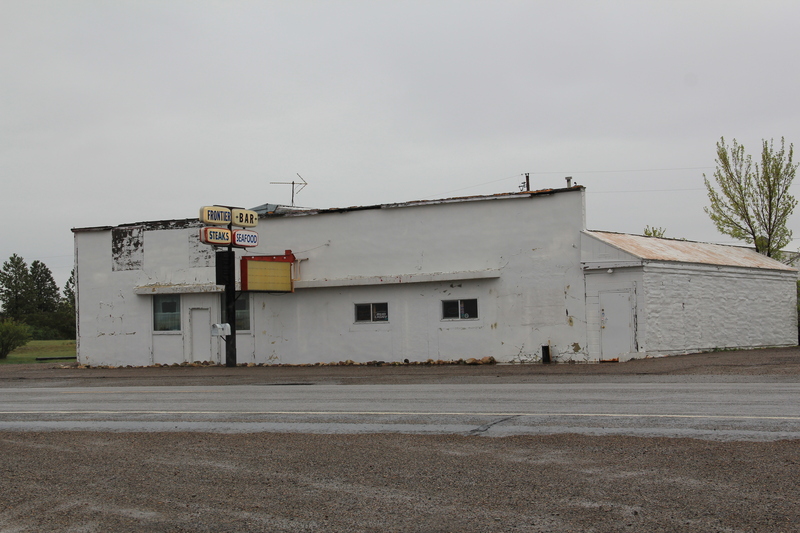 In between these two landmarks grew an impressive collection of commercial buildings, along with some of the best roadside neon in the state. Modernism isn’t confined to the commercial strip. 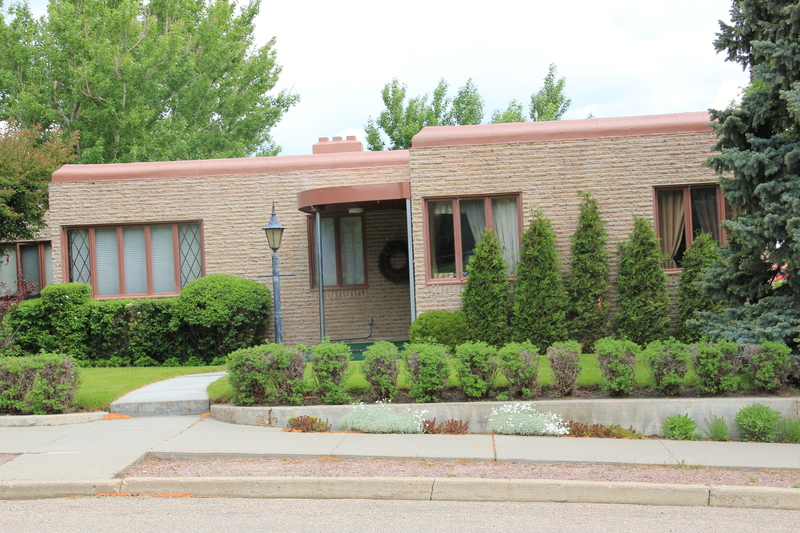 There are impressive residential designs of International Style and Art Deco from the 1930s. 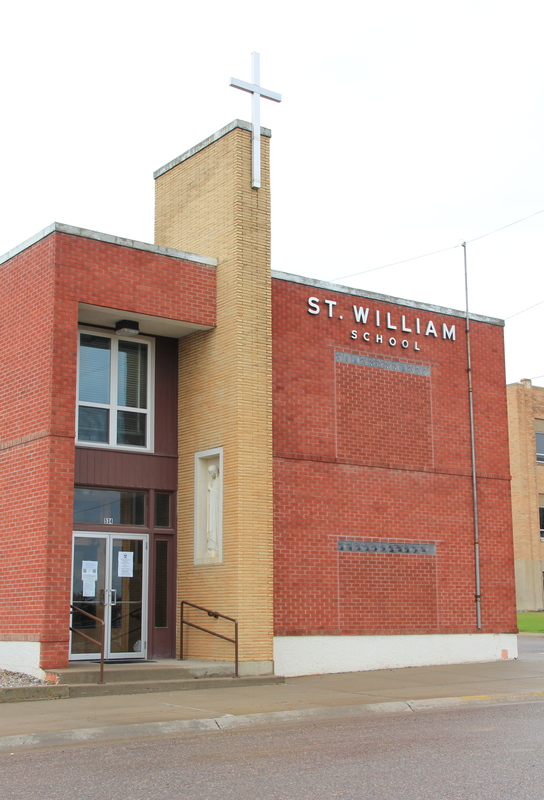 And both the New Deal Art Deco high school (now middle school) and the contemporary-styled St. William Catholic School make their own statements of mid-century modern architecture. 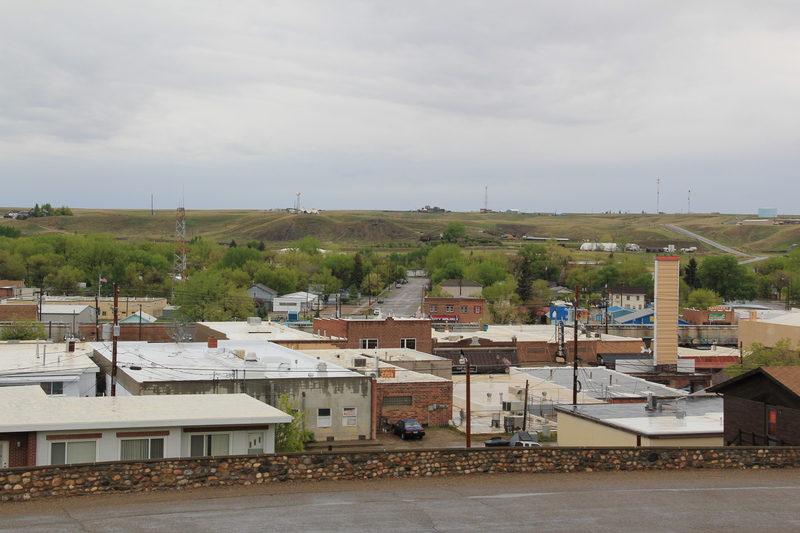 Shelby might be a modern urban oasis on the Hi-Line but as soon as I started to move east of the visitor center along U.S. 2 I discovered that I was entering a very rural, agricultural landscape: more on that later. 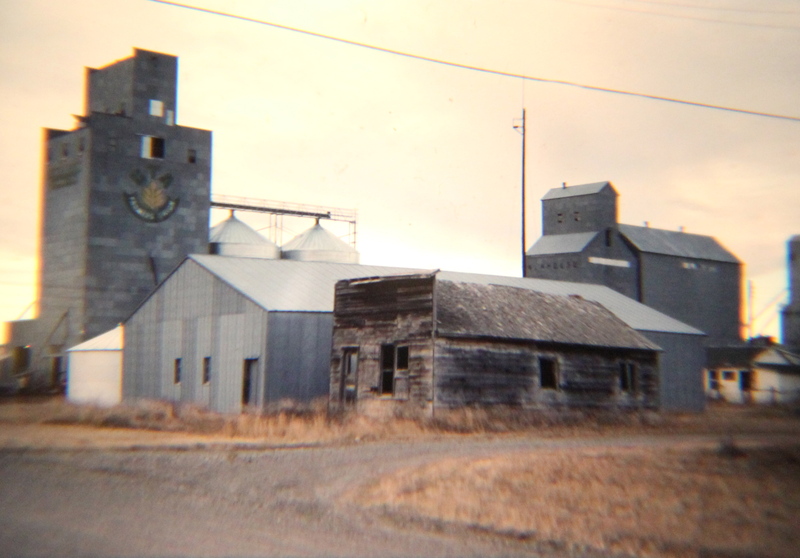 My exploration of Montana’s historic landscape–an experience that has shaped my career and teaching philosophy so deeply–began in earnest 30 years ago this month. 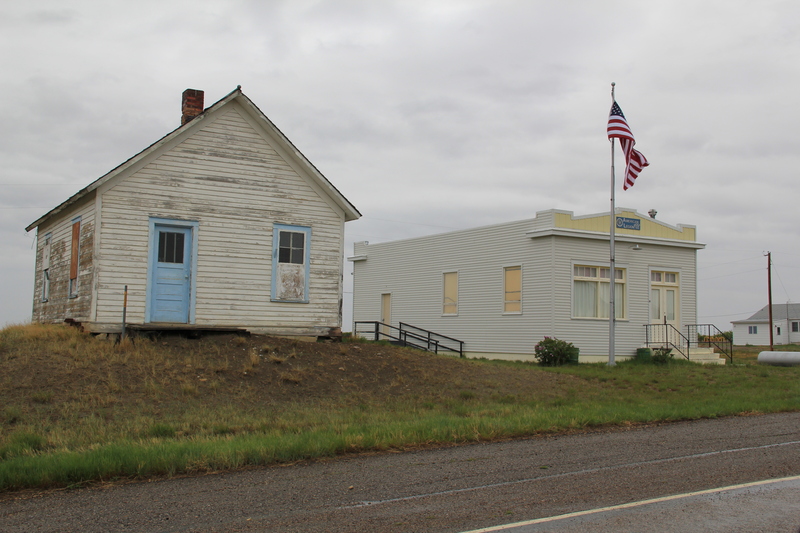 I had been working with the Montana State Historic Preservation Office for several weeks, organizing information already known about the state but also realizing that much was unknown. That is why the MT SHPO Marcella Sherfy wanted to send someone out of the road–to look, listen, and find what was missing. 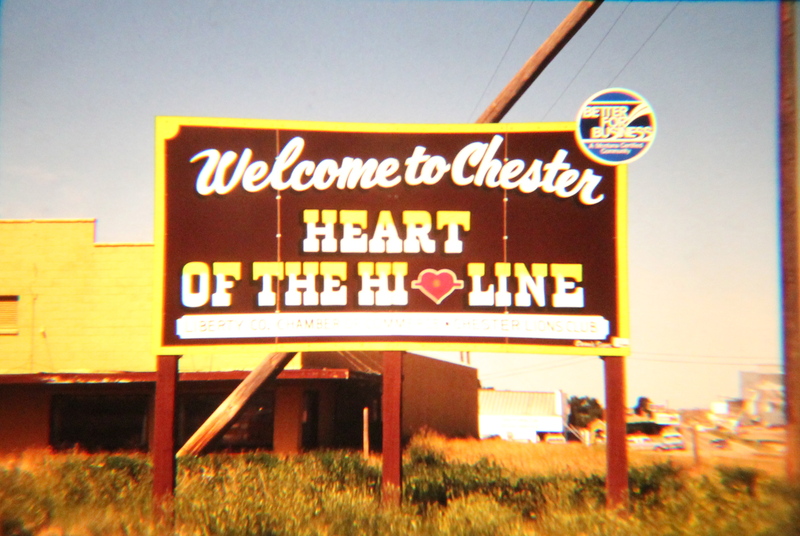 In February 1984, the fieldwork began, with the initial focus on the Hi-Line and the first stop, Toole County and the county seat of Shelby. The first stop was Shelby, where I also launched my effort to talk about historic places and the preservation planning process with local communities. We met at the local library/museum which stood next to the courthouse. 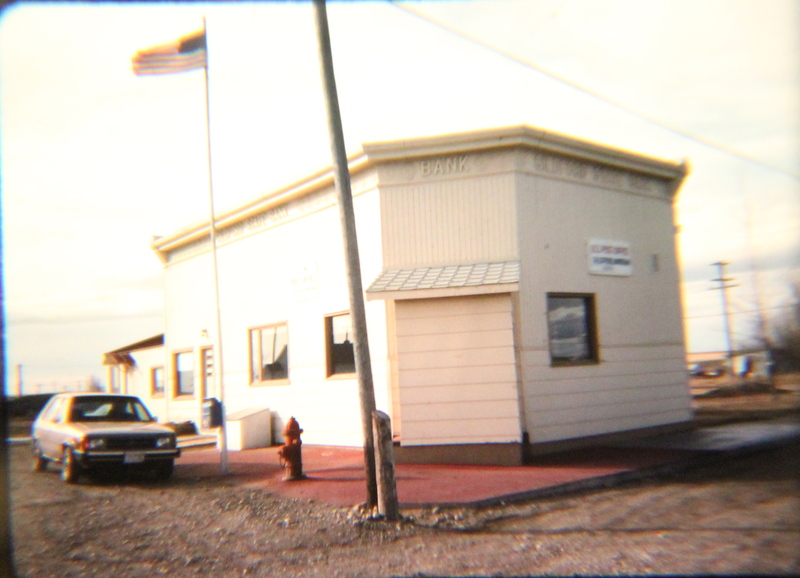 I learned two things that February 1984 night in Shelby that shaped my work for the next 3 months: do the community meetings first–Montanans were intensely engaged with their history and made information and primary sources to share. 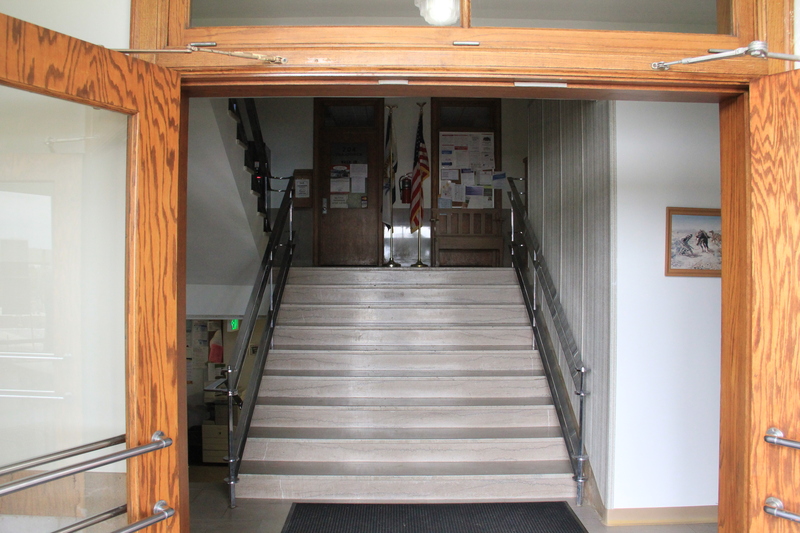 Just as important, I learned of their pride in the county courthouse–an architectural statement of Art Deco modernism in the guise of local materials and stone that might not be “technically eligible” for the National Register (at that time it was not yet 50 years old) but that everyone considered the landmark of the city. 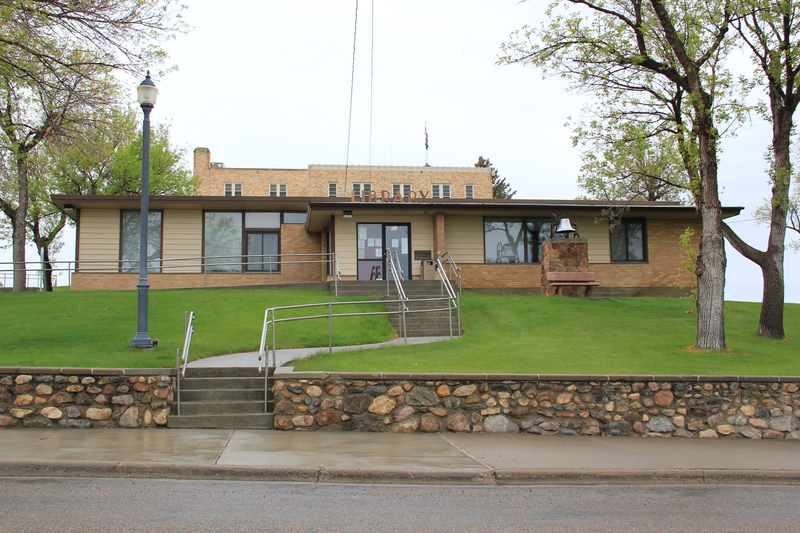 This 1934 building, one of the many Federal Emergency Relief Administration projects that shaped small towns and agricultural landscapes across the state during the Great Depression, looms high over the time, with the overall setting enhanced by the period landscaping and stone veneer steps from the parking area to the front door. 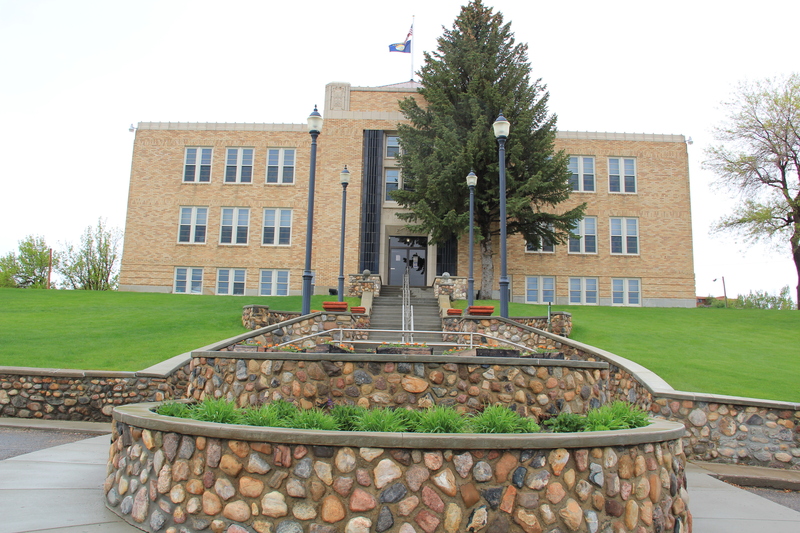 The new courthouse gave the town a new focus, away from the railroad corridor created by the Great Northern Railway, and then the flashy commercial strip of stores and taverns along the adjacent highway corridor of U.S. Highway 2, a route also improved during the New Deal years. 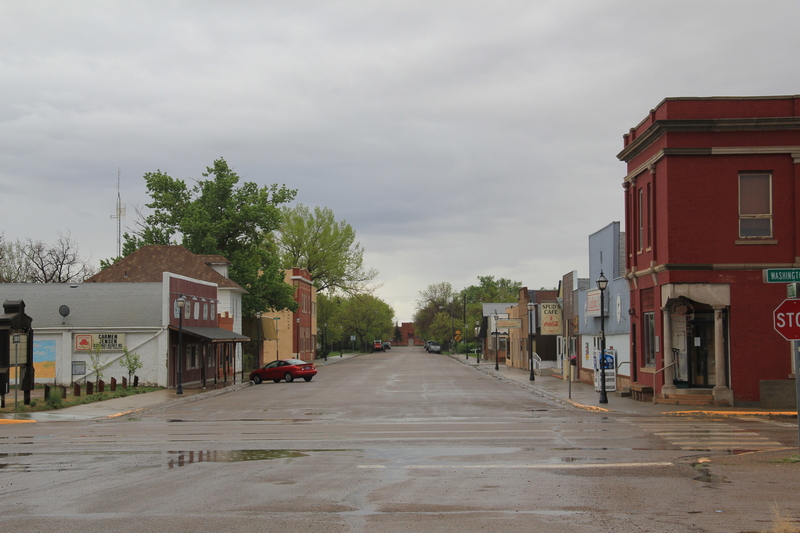 In Shelby, at the first of the 1984 work, I learned of the imprint of the successive waves of the railroad, then highways, and then the New Deal on Montana’s Hi-Line towns. Those patterns of development would be constants throughout the fieldwork. 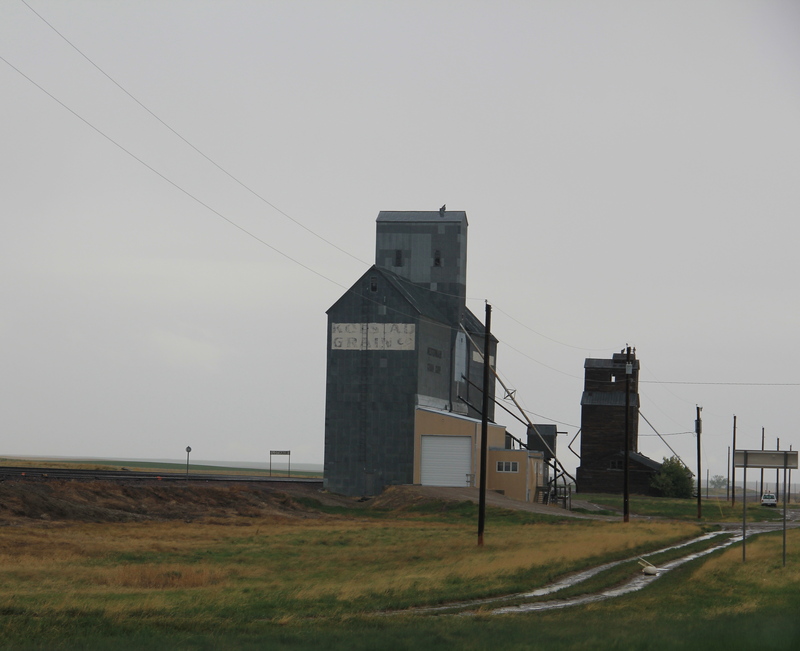 But after the stop to Shelby, I was then ready to explore the surrounding rural landscape. And that will be the next story.